Words were Winston Churchill’s stock-in-trade. And Winston’s words are our own stock-in-trade. But sometimes a photo is worth a proverbial thousand words. This is one. 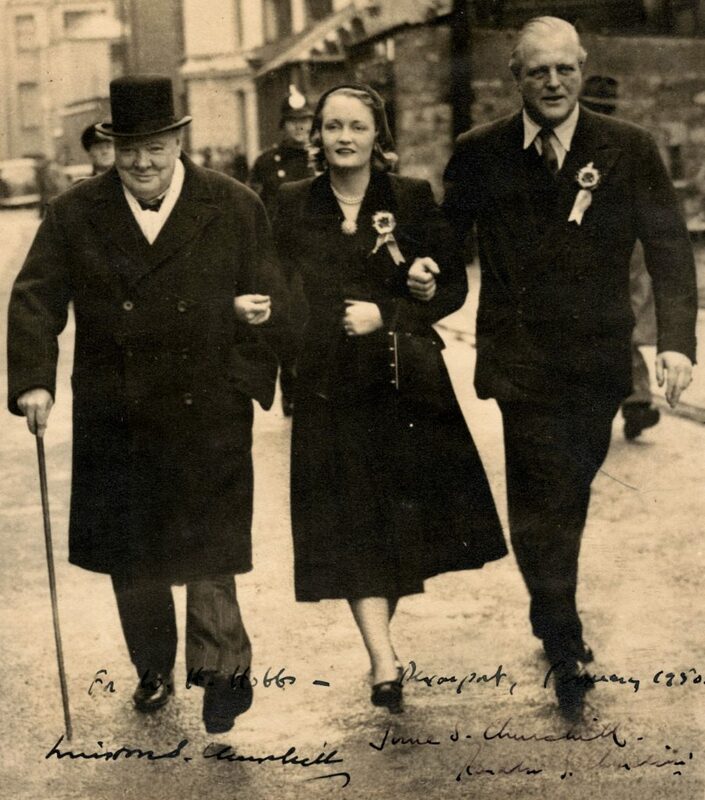 This February 1950 photo features Winston S. Churchill striding arm-in-arm with his daughter-in-law, June, and son, Randolph, in the constituency Randolph would lose that month to future Labour Leader Michael Foot. And just in case you still prefer words, this one comes with some. Inked at the bottom of the image is: “For W. H. Hobbs – Devonport February 1950”. 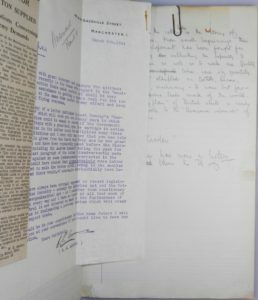 Below and to the left is the signature of “Winston S. Churchill”. 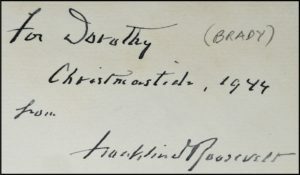 To the right is the signature of “June S. Churchill”, below and to the right of which is the signature of “Randolph S. Churchill”. This photo is not only striking and particularly noteworthy signed thus, but also a poignant reminder of the disappointments that marked Randolph’s life and his relationship with his father. Devonport is in the City of Plymouth in the constituency twice unsuccessfully contested by Randolph. 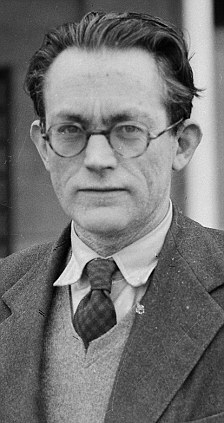 His opponent, future Labour Leader Michael Mackintosh Foot (1913-2010), first won the seat in the same July 1945 General Election in which Winston lost his wartime premiership to Labour’s Clement Attlee. Foot defeated Randolph in the February 1950 General Election by 3,483 votes. In the General Election of October 1951 – Randolph’s final attempt to return to Parliament – he lost again to Foot (this time by 2,390 votes). 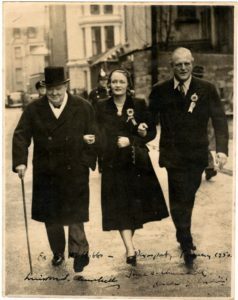 Despite Randolph’s own failure, this same election returned his father’s Conservatives to majority and Winston to 10 Downing Street for his second and final premiership. Notwithstanding election rivalry, Foot would say: “I belong to the most exclusive club in London; the friends of Randolph Churchill.” During the 1950 campaign, it would seem that Randolph’s friends were in short supply; it was reportedly Foot and his wife who looked after the rival candidate, sobering him up and seeing him on his train after he had been abandoned by his own party activists. (Morgan, Michael Foot: A Life) Foot became Labour Party leader in 1980, losing his position when Labour lost the General Election to Thatcher in 1983. Randolph (1911-1968) had Churchillian gifts which he ultimately failed to fully refine and apply. British historian Andrew Roberts has said: “Aside from his heroically dismal manners, his gambling, arrogance, vicious temper, indiscretions, and aggression,” Randolph “was generous, patriotic, extravagant and amazingly courageous.” Randolph dwelt in his father’s shadow and often disappointed him. Nonetheless, “Winston Churchill never let the sun go down upon his wrath, and when Randolph’s idleness ended in lecture tours and races for Parliament, he lent his support, even when his son’s campaigns were politically unhelpful to him. 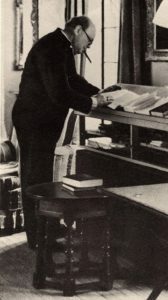 During World War II, when Randolph served with distinction in North Africa and Yugoslavia, Winston entrusted him with sensitive tasks which he performed with skill and discretion… After the war, Churchill willed his invaluable archive to Randolph; and in 1959, he bestowed the ultimate accolade by inviting Randolph to be his official biographer.” (Richard Langworth) Perhaps symbolically, Randolph completed only the first two volumes before he died in 1968. June Churchill nee Osborne (1922-1980) was Randolph’s second wife, from 1948-1961. Their marriage produced Randolph’s second child and only daughter, Arabella. Provenance of this photo is the family of the recipient, W. H. Hobbs, who served in the Royal Navy with distinction during the Second World War, receiving the Distinguished Service Cross, and was reportedly a Plymouth Councilor in 1950 when this photograph was inscribed for him. Condition of the photo approaches very good, showing light scuffing, trivial blemishes, and minor wear to edges, the verso with spotting and tape residue and minor scarring at corners. 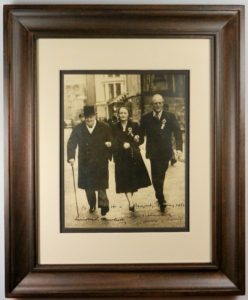 The photo is removably mounted in an 11×14 wood frame with acid-free, archival mat. 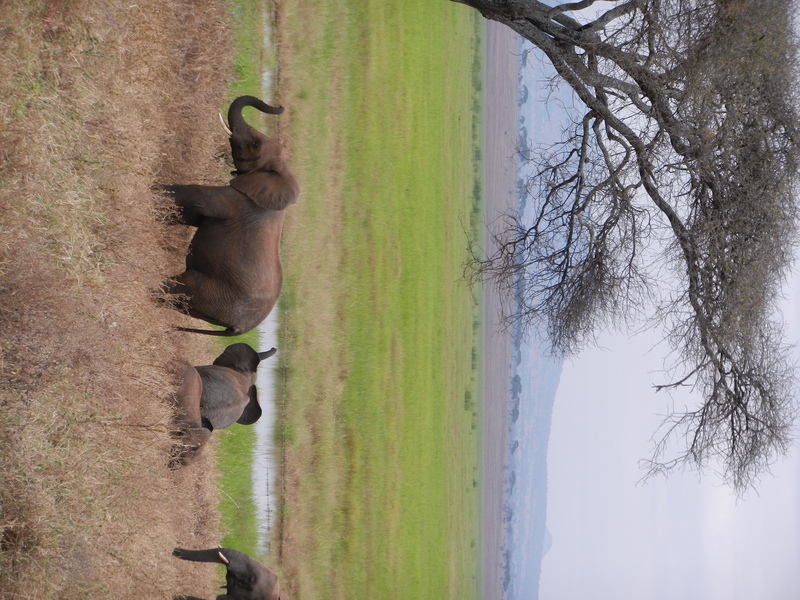 We’re pleased to offer this photo for sale HERE. We have the privilege of being able to tell you about a remarkable memento of a remarkable moment in history. 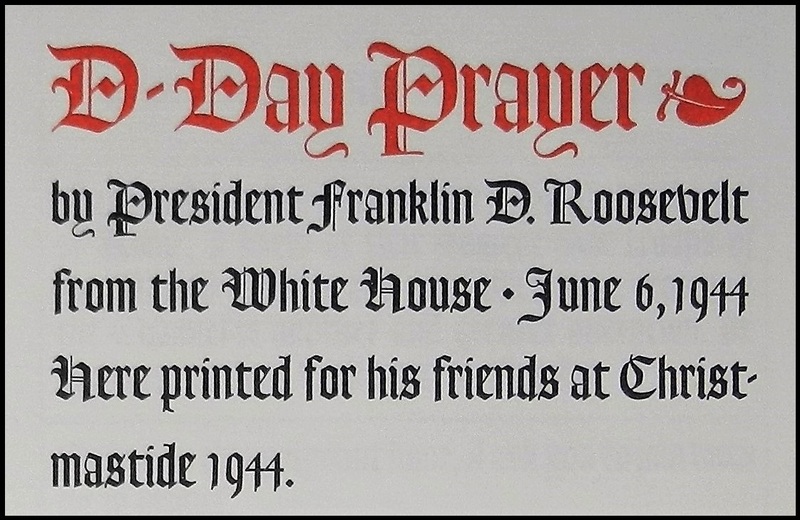 This is the limited edition of President Franklin Delano Roosevelt’s D-Day prayer, commissioned from the U.S. Government Printing Office by Roosevelt at his own expense and inscribed by him to his secretary, Dorothy Jones Brady. The inscription, inked in four lines on the front free endpaper, reads: “For Dorothy | Christmastide, 1944 | from | Franklin D. Roosevelt”. 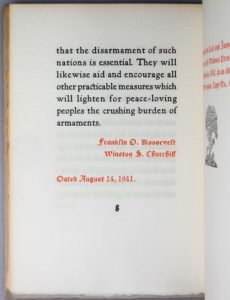 Per the limitation page, one hundred copies were printed “for President Franklin D. Roosevelt at the U.S. Government Printing Office at Washington” in December 1944. This copy is hand numbered “68” of 100. 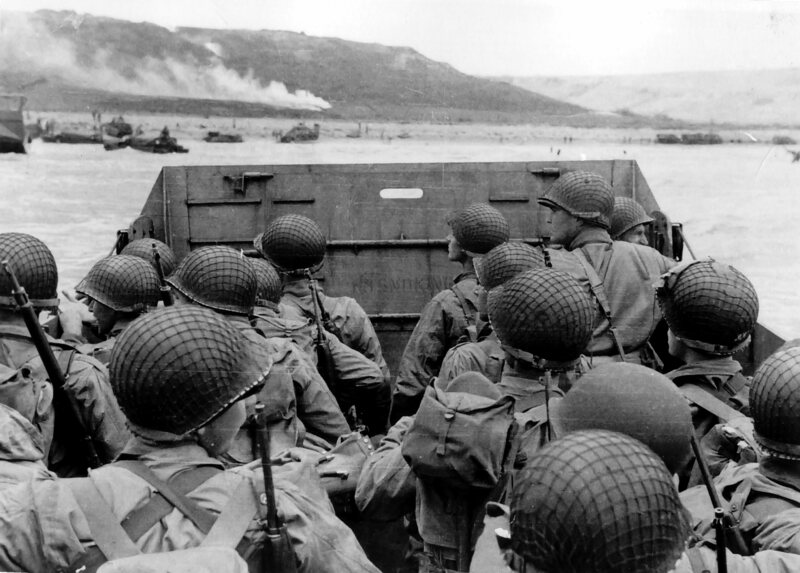 On 6 June 1944, the United States and its WWII allies launched the largest amphibious invasion in history. More than 150,000 soldiers, sailors, and airmen had crossed the English Channel to storm the beaches at Normandy, beginning the campaign that would end with the unconditional surrender of Germany in May 1945. In his national radio address of 6 June, both the situation and the tone were strikingly different. 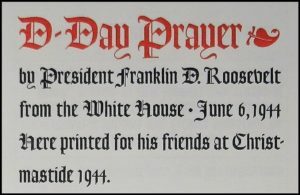 President Roosevelt did not provide a factual report on events, but asked his countrymen to join him in a nearly 600-word prayer he had written himself. Roosevelt’s candid recognition suited the perilousness of the undertaking and the uncertainty of the outcome. “They will need Thy blessings. Their road will be long and hard. For the enemy is strong. He may hurl back our forces. Success may not come with rushing speed, but we shall return again and again; and we know that by Thy grace, and by the righteousness of our cause, our sons will triumph. 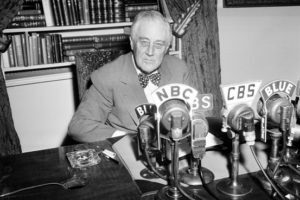 Even in the midst of the most extreme violence, Roosevelt sought to morally delineate the cause of his nation and its Allies from that of its foes. In so framing history’s largest amphibious invasion, Roosevelt drew a clear line between invaders and liberators, and set definitive limits to the scope and duration of military ambition. “For these men are lately drawn from the ways of peace. The fight not for the lust of conquest. They fight to end conquest. They fight to liberate. They fight to let justice arise, and tolerance and goodwill among all Thy people. They yearn but for the end of battle, for the return to the haven of home. Roosevelt asked his countrymen for patience and resolve, attempting to prepare them for the inevitable hardship and loss that would attend wresting control of continental Europe from Nazi Germany. Interestingly, future President Dwight D. Eisenhower, supreme commander of the D-Day invasion, would title his own 1948 war memoirs Crusade in Europe. “Let not the keenness of our spirit ever be dulled. Let not the impacts of temporary events, of temporal matters of but fleeting moment – let not these deter us in our unconquerable purpose. With Thy blessing, we shall prevail over the unholy forces of our enemy. Help us to conquer the apostles of greed and racial arrogances. Lead us to the saving of our country, and with our sister nations into a world unity that will spell a sure peace – a peace invulnerable to the schemings of unworthy men. And a peace that will let all men live in freedom, reaping the just rewards of their honest toil. On 7 November 1944, Roosevelt was re-elected President for an unprecedented fourth term. 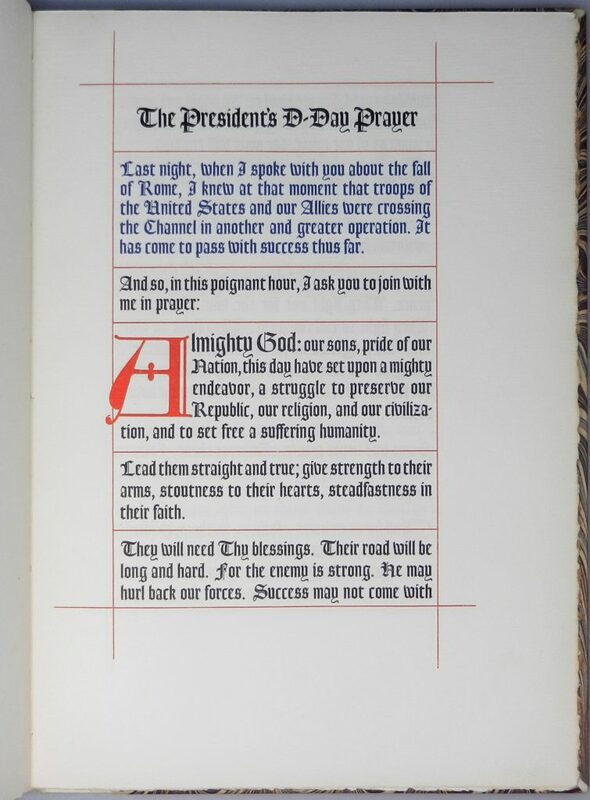 In December, this limited issue of his D-Day prayer was printed “for his friends at Christmastide”. This copy of Roosevelt’s D-Day Prayer was inscribed by FDR for Dorothy Jones Brady, his White House secretary and stenographer. Brady began her federal career at the Department of Agriculture secretarial pool. Reassigned to the White House, she became secretary to presidential press secretary Steve Early. 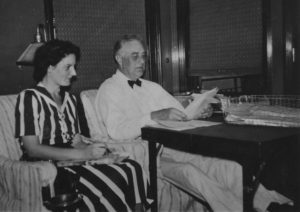 After substituting several times for the FDR’s secretary, Grace Tully, Brady accompanied FDR on campaign trips and on visits to his home at Hyde Park. She was with FDR when he died on 12 April 1945, less than a year after D-Day and less than a month before Germany’s 7 May 1945 unconditional surrender. Brady went on to serve as secretary to cabinet secretaries and assistant to the president of the Pullman railroad car company. She died at age 87 in 1999. The 100 copies of Roosevelt’s D-Day Prayer printed in 1944 were the last of FDR’s Christmas books, and arguably the most poignant. 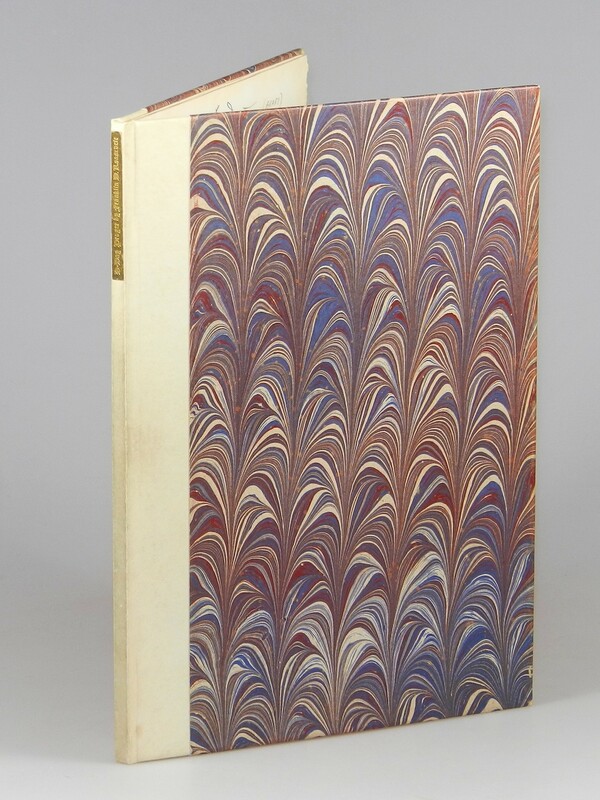 The original fine binding features a quarter vellum spine over marbled paper-covered boards. 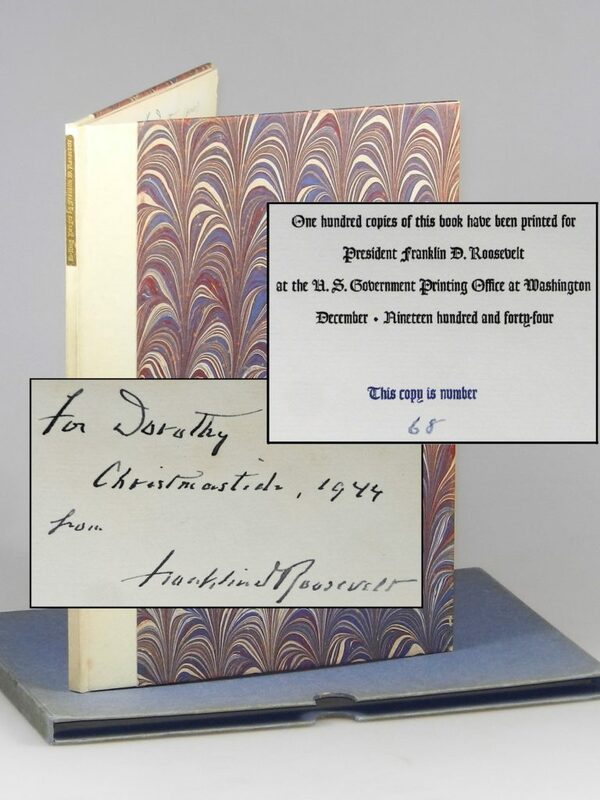 A gilt-stamped morocco spine label reads: “D-Day Prayer by Franklin D. Roosevelt”. The contents are printed black, blue, and red on laid paper with untrimmed fore and bottom edges and gilt top edge. The prayer is separated into short stanzas, each framed with a red ruled box. Condition is near fine. The binding is square and tight with sharp corners and almost no wear. We note mild soiling to the spine, notably at the slipcase cutout. The contents show mild age-toning to the page edges and light spotting, primarily to the endpapers. 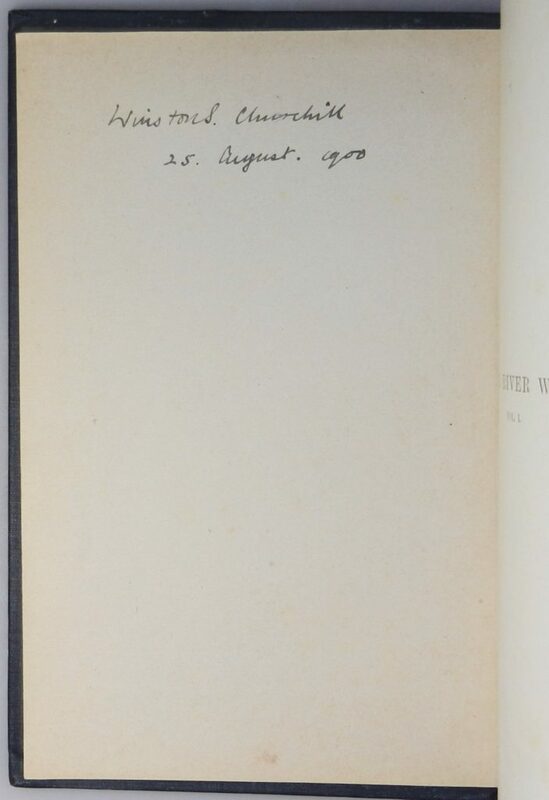 The blank leaf following the text and preceding the limitation page shows some wrinkling and a vertical crease. 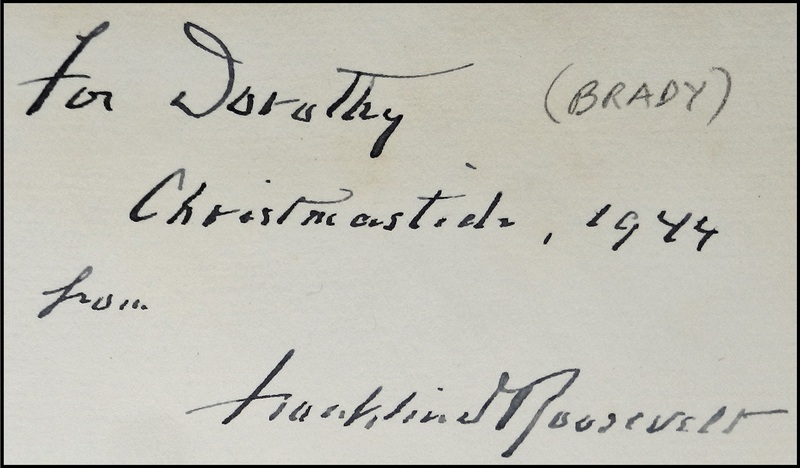 The name “(Brady)” is written in pencil beside President Roosevelt’s inscription. 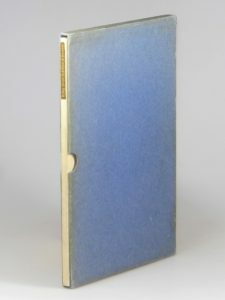 The volume is housed in the original blue paper-covered card slipcase. The slipcase is fully intact with modest toning and wear to extremities. This piece of history is offered for sale HERE. 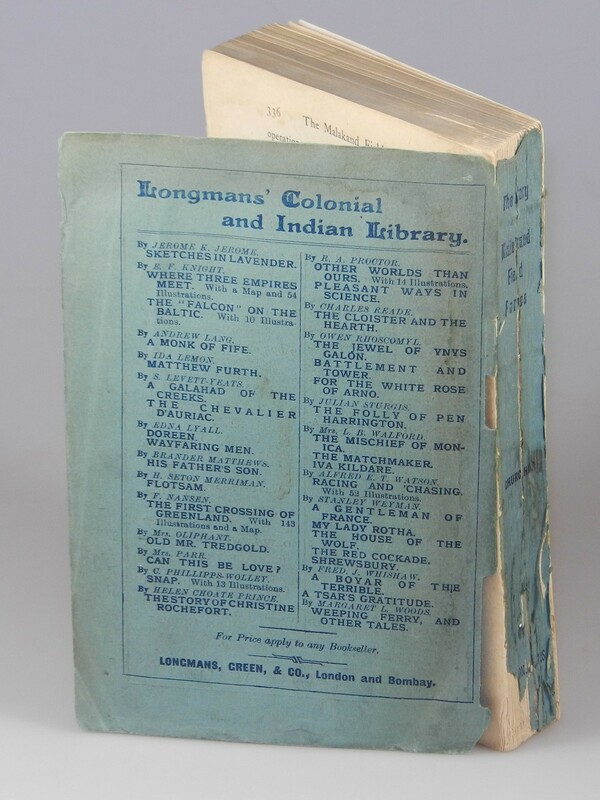 We have just listed a rather remarkable artefact of British colonial presence in India. 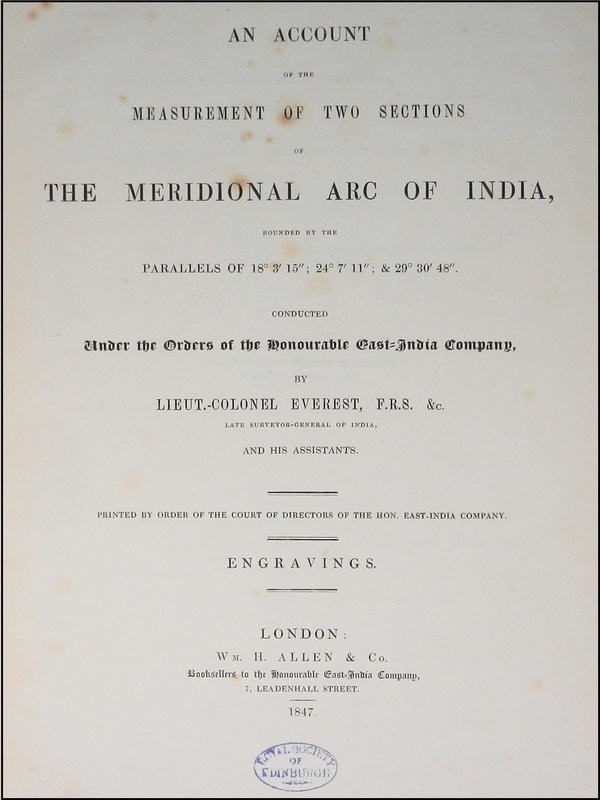 Mammoth in every sense, this is the 1847, two-volume, first edition of George Everest’s account of his epic survey of the Indian subcontinent. Everest’s survey is the reason why the world’s tallest peak, Mount Everest, was named for this British geodesist and military engineer. This elaborate and rare set is a presentation copy in the original binding from the author to the Royal Society of Edinburgh at the behest of the Directors of the East India Company. Each volume is inscribed on the front free endpaper: “Presented by order of the Court of Directors | of the Hon’ble E. I. Company of Great Britain | to the Royal Society of Edinburgh | By the Author”. 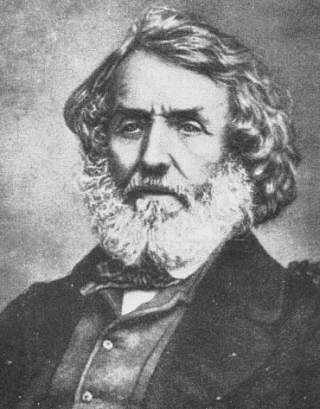 Sir George Everest (1790-1866) joined the East India Company as a cadet and sailed for India in 1806. 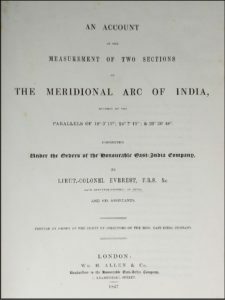 Engineering successes and proficiency in mathematics and astronomy led to his being appointed chief assistant to the great trigonometrical survey of India in 1817. 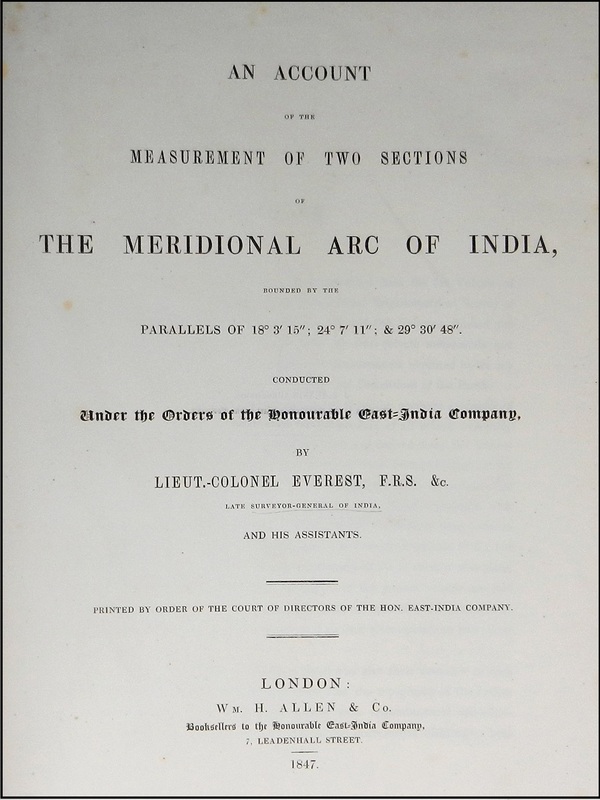 This survey, dauntingly ambitious on an imperial scale, began in 1802 and “was of international geodetic importance because of its part in determining the figure of the earth.” Everest’s task was to complete the arc that had begun at the southern tip of India, work which he continued as superintendent after the 1823 death of William Lambton, his predecessor. In late 1843, Everest retired and returned to England. 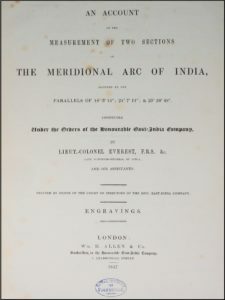 His 1847 publication of An Account of the Measurement of Two Sections of the Meridional Arc of India earned Everest the medal of the Royal Astronomical Society as well as election as an honorary member of the Asiatic Society of Bengal and fellow of the Royal Asiatic and Royal Geographical societies. 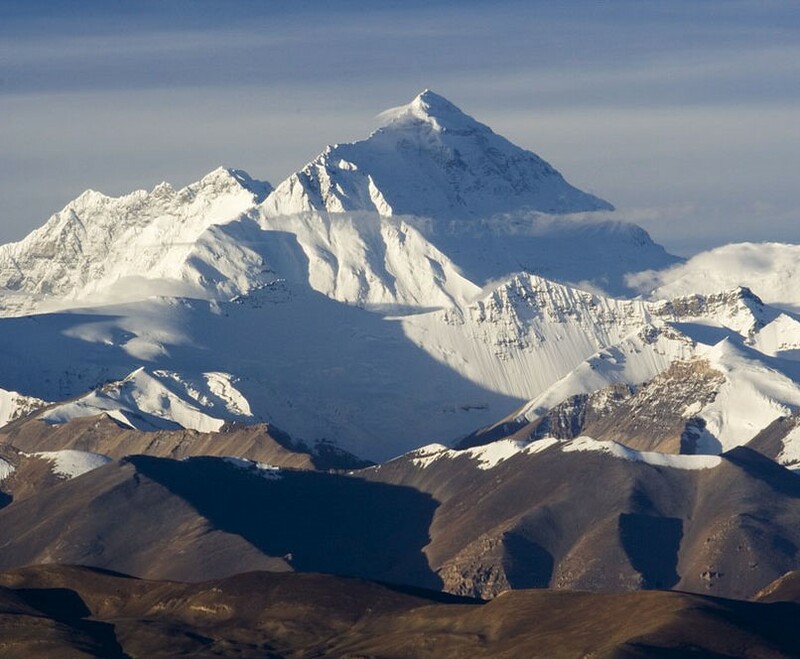 In 1856, Everest’s name was given by his successor in India, Andrew Waugh, to Peak XV in the Himalayas, the highest summit in the world at 29,029 feet. Everest’s two-volume work is a magnificently detailed and elaborate publication, rarely seen on the word market and particularly scarce thus – an author’s presentation copy in the original publisher’s bindings. 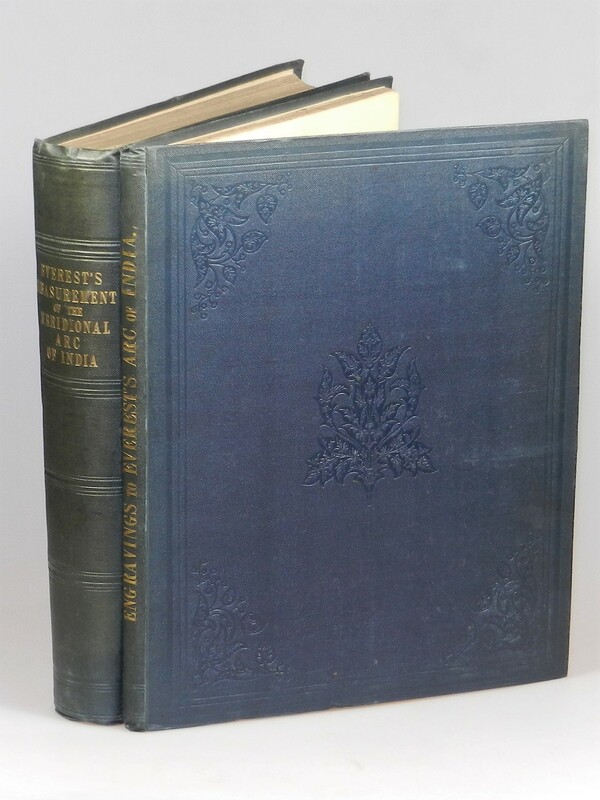 The handsome original dark blue cloth bindings measure nearly 13 x 10.25 inches, with gilt spine print, blind ruled spine compartments, and blind ruled front cover borders with blind stamped floral motif at corners and center within. The contents are extensively illustrated. The text volume includes an engraved frontispiece and two plates, illustrations (one with volvelle), and tables (several folding). 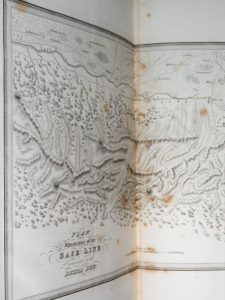 The Engravings volume includes thirty-two engraved plates, one plate with volvelle, one double-page map, and two enormous folding plan sections. The lower title page of the Engravings volume bears the oval ink stamp of the Royal Society of Edinburgh. We are pleased to offer this magnificent set for sale, HERE. 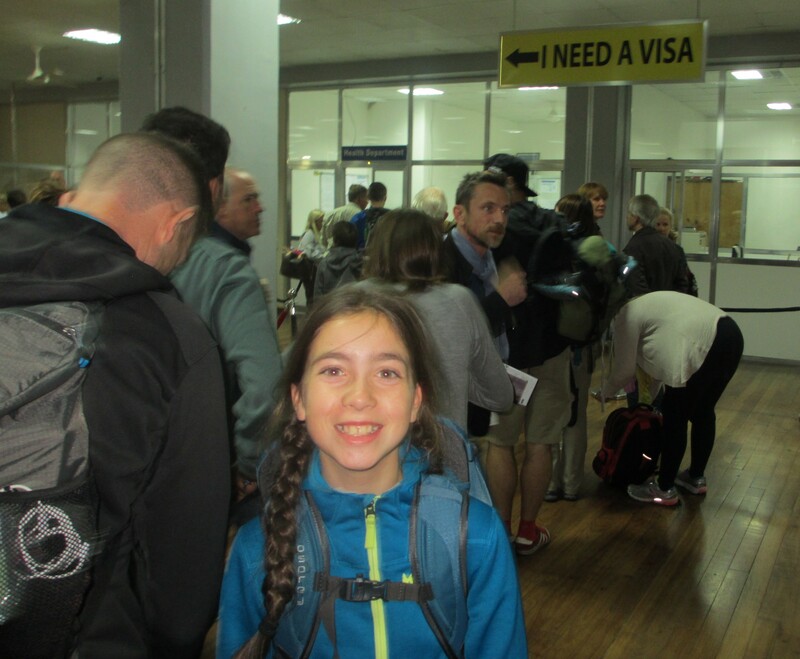 So how about a 9,000 word blog post? On Wednesday, February 1st, Marc had the honor of being invited to Pasadena to address the Zamorano Club, Southern California’s oldest organization of bibliophiles and manuscript collectors, founded in 1928. 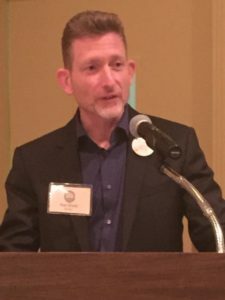 His talk was titled Living Words: The Language, Life, and Leadership of Winston S. Churchill. Marc spoke for roughly 45 minutes to a full room, followed by Q&A. We include the full text of his talk below. Greg’s a friend and he knows me pretty well. So there’s no way I would have such a nice introduction unless I paid him. Greg, thanks for taking the money. Yes? Good…. But the World War II – V for Victory – Blood Sweat and Tears Churchill is not the only Churchill I’m here to talk about tonight. I’m here to talk about Churchill the wordsmith. About the living, vital, incessant torrent of words that stitched the fabric of his long and incredible life. That’s because – like all of you here tonight – I love the splendid alchemy of words. Words are the true engine of our intelligence and perhaps the most potent instrument we use to shape the world. To question, conceive, and span. As you all seemed to agree back in 1928, books are a pretty darn good place to keep words. So I hope you’ll pardon me for quoting Churchill for the first of many times tonight. As a professional bookseller, I spend most of my days in the company of Churchill’s words. Thank you for inviting me to share with you a bit about the Churchill I’ve come to know. Since I’ll be talking for a while, let me do you the courtesy of telling you what I’ll be talking about. The title of my talk this evening is “Living Words”. Like us, Churchill loved words. But perhaps more than any of us in this room, Churchill understood – and lived – that “splendid alchemy” I was just talking about a few minutes ago. I’ll start by giving you some of my own perspective on Churchill. Then I’ll talk about his life, his language, and his leadership – roughly in that order, but of course with some overlap. Please note the absence of a laptop and projection system. I have given –and suffered through – entirely too many Power Point presentations. So no slides today folks. The good news is that I have props! To prevent myself from lulling you to sleep, I will pass around a few precious and quite valuable objects. Please handle them with great care and please do not take any of the items that are in plastic sleeves out of the plastic sleeves. Oh, and please do give them back. So. Let’s talk a little about Churchill’s life. I intend to say a lot of complimentary and interesting things about Winston Churchill today. But before I do, I want to say something else. Fat. Lisping. Bath-taking. Jumpsuit-wearing. Privileged. Self-indulgent. Spendthrift. Brash. Egocentric. Impulsive. Impatient. Wrong. And sometimes wrong with the same bullish vigor as when he was right. As Churchill recedes into history, there is danger in putting him on a pedestal. In marbling and bronzing him into irrelevance. 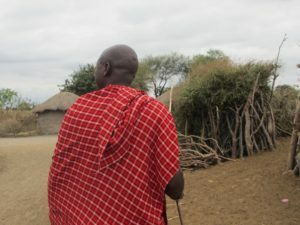 He was a truly remarkable man, but still just a man. Among those who praise Churchill, there is a tendency to act as if he had unerring judgment and prescience. To envelop him in a blind and dulling reverence. Infallibility is boring. Churchill was anything but boring. And at times he was markedly irreverent. Why should we be any less? My own regard for Churchill is for his intense, monumental humanity. For a magnificence of spirit, of mind, and of will that both embraces and eclipses imperfections. So let’s round out the picture of who Winston Churchill was. I have always loved this cartoon. It shows – with great irreverence – so many of the roles Churchill already played with such versatility and skill nearly three decades before he became prime minister. For better or worse, Churchill’s official biography holds the Guiness World Records title for world’s longest biography. There’s a reason. It has become common for each generation to claim that they have experienced more change – technological, cultural, and geopolitical – than any preceding. When I hear millennials make such a claim, just because they have social media accounts and smart phones, I encourage them to consider Churchill. The young war correspondent and British imperial soldier who participated in “the last great cavalry charge in British history” would later help design the tank, pilot aircraft, direct use of some of the earliest computers – for World War II code breaking – and ultimately preside as Prime Minister over the first British nuclear weapons test. This icon of the British Conservative Party dramatically repudiated the Conservatives in his early career and spent 20 years as a Liberal, championing progressive causes and being branded a traitor to his class. 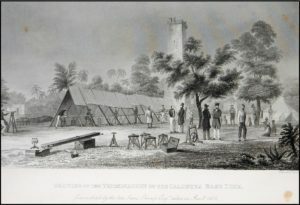 This soldier and scion of British imperialism wrote his first published book in a tent on the northwest frontier of colonial India. He would later bear witness to, and hold power during, devolution of the British Empire, along the way supporting causes contrary to prevailing sentiment of his caste and country – early and vigorously – such as Irish Home Rule and a Jewish national home in Palestine. First elected to Parliament during the reign of Queen Victoria, Churchill would serve as the first Prime Minister under the currently reigning Queen Elizabeth II. Churchill lived for more than 90 years. He spent more than 60 of these years as an elected Member of Parliament. He served in the British Cabinet during every decade for the first half of the twentieth century. He occupied high public office during both of the twentieth century’s world wars. But even that only tells a fraction of his tale. And through it all, Churchill’s career was declared finished and resuscitated a ludicrous number of times. As a student, when he conspicuously failed to excel in most subjects. When he sought to attend the Royal Military College at Sandhurst he twice failed the entrance exams. He just barely qualified for infantry, and ended up taking a cavalry post. Cavalry had lower standards than infantry. In 1904, he famously “crossed the aisle” in Parliament, leaving the Conservative Party of his father to become a Liberal. In 1915, he was blamed for disaster in the infamous Dardanelles campaign and forced to resign from the Cabinet. He would go from heading the Royal Navy to leading a battalion in the trenches. In 1922, he suffered both the loss of his seat in Parliament and the electoral destruction of his Liberal Party. Throughout the 1930s. These were Churchill’s “wilderness years,” when he was out of power and out of favor, persistently seeking to draw attention, resources and resolve to face the growing Nazi threat. Churchill passed from his mid-50s into his mid-60s with his personal fortunes and those of his country ever receding. Not until he was 65 years old did he finally become Prime Minister, and then during the most desperate circumstances for his nation and the free world. Even after the Second World War. In 1945, Churchill’s party was voted out of office. At the end of the war he had done so much to win, he lost his premiership. Churchill had to accept frustration of his postwar plans and settle for being Leader of the Opposition for six long years until he finally returned to 10 Downing Street in 1951 for his second and final premiership. And these were only political losses. Winston Churchill’s father, Lord Randolph, died in January 1895 at age 45 following the spectacular collapse of both his health and political career. His son Winston was 20 years old. Churchill lost a daughter to illness in 1921. And another to suicide in his final years. He lost his fortune to the stock market crash of 1929. During both of his premierships, he struggled with his health, to maintain and project the vitality that his responsibilities demanded. But Churchill is even more than an epic tale of resolve and resilience. Much more, actually. Perhaps the most remarkable aspect of Churchill’s life is his extraordinary breath of both mind and experience. Before his mid-twenties, Churchill managed to become one of the highest paid war correspondents in the world. He reported from battlefields on three different continents, but also saw more than his share of fighting, including capture and a daring, improbable escape during the Boer War in South Africa. Fascinated by powered flight, Churchill was a pilot. During the terrible trench warfare stalemate of the First World War, it was Churchill who helped conceive and promote the tank, ushering in the age of mobile warfare. Mind you, at the time he was in charge of the Navy. In the darkest days of that war, Churchill discovered painting, which became a passion and source of release and renewal for the remaining half century of his long life. He would ultimately paint more than 500 canvasses. An implacable foe of Germany in two world wars, Churchill would help conceive and advocate the two transnational institutions most responsible for promoting peace in the world – the United Nations and European Union. Churchill championed both Irish home rule and a Jewish national home in Palestine – early, ardently, and consistently. And these were only a few among many progressive causes that the Conservative icon championed, defying the agendas of both his party and class. It was Churchill who, in the first decades of the twentieth century, did so much to lay the foundations of the modern welfare state, not only championing social programs, but also the funding for them, supporting a graduated income tax, luxury tax, and surtaxes on unearned income. We could easily fill our evening talking just about the events of Churchill’s life. But there were no shortage of great figures and great deeds in the twentieth century. So I’d like to talk about what made Churchill’s life so compelling – his language and his leadership. Perhaps more than anything else, Churchill was a master wordsmith. And this was no accident. “Of all the talents bestowed upon men, none is so precious as the gift of oratory. He who enjoys it wields a power more durable than that of a great king. He is an independent force in the world. This is a good time for another prop. Remember I said that Churchill had an early – and quite successful – career as a war correspondent. I’m going to pass around a truly unique item we were pleased to discover a few years ago. This is an autograph booklet from the September 1900 Institute of Journalists annual conference in London, signed by a young Winston Churchill and 28 other of his fellow journalists. We have found no record that preserves Churchill’s remarks at the Dinner, but his autograph we’re passing around proves that he attended. Likely it was less “unconnected with politics” than Churchill let on. 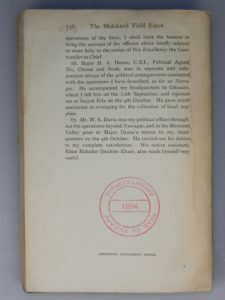 Less than a month after he signed this booklet, on October 1st 1900, Churchill won his first seat in Parliament in the so-called “khaki election”. 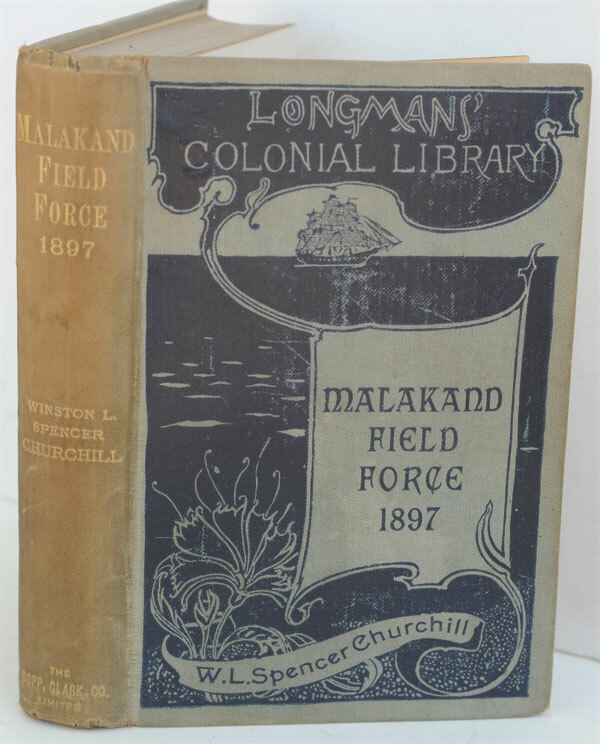 Churchill had returned from the Boer War only in July 1900, spending the summer campaigning hard in Oldham and capitalizing on his capture and daring escape, and war dispatches from South Africa. It was a still very 19th Century Churchill who left this signature in this autograph book. After the election, Churchill would leave for his first North American lecture tour. While Churchill was abroad, Queen Victoria died, and the end of her 64-year reign also closed Churchill’s Victorian career as a cavalry officer and war correspondent adventurer. Churchill returned to England in February 1901 to take his seat in Parliament and begin a 60-year career as one of the 20th Century’s great statesmen. Again, please don’t take this item out of the protective sleeve. Churchill was 23 when his first book was published – The Story of the Malakand Field Force. It was based on his dispatches to the Daily Telegraph and the Pioneer Mail, but this was his first book-length work. Having invested his ambition in the book, he clearly labored over it: “I have discovered a great power of application which I did not think I possessed. For two months I have worked not less than five hours a day.” The finished manuscript was sent to his mother on the last day of 1897 and published on March 14th, 1898. Just the Bibliography of Churchill’s published works requires three volumes. What’s so special about all these words? Why should we care about the words of a 20th century politician with some distinctly 19th century sensibilities? Because of what he saw and how he wrote it. Because we still – maybe even more than ever – use words to frame the world as we see it and to share what we see with others. And Churchill both saw more and framed his perceptions more compellingly than perhaps any world leader before or since. till the whole wide mountain region rocked with the confusion of the tumult. Slender wires and long-drawn cables carried them to the far-off countries of the West. they detected the dull, discordant tones of decline and fall. Families in English homes feared that the detonations marked the death of those they loved – sons, brothers or husbands. 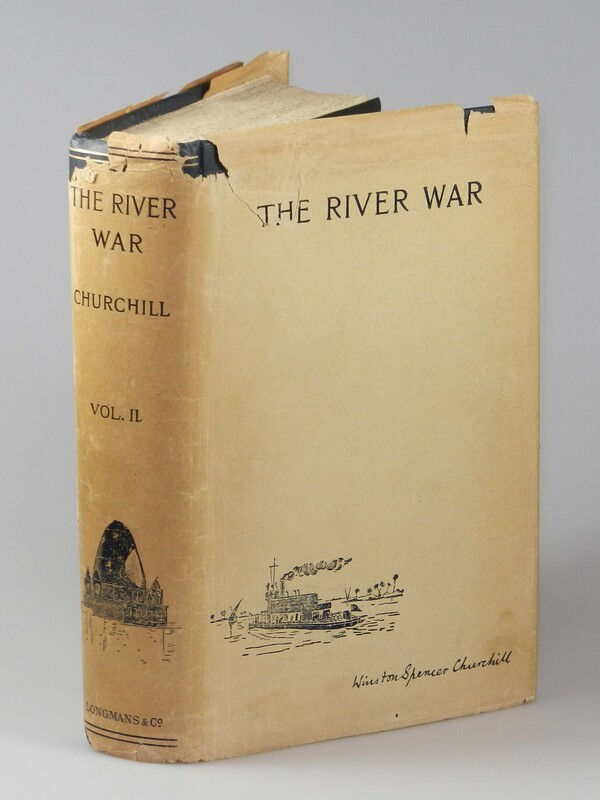 Next, a passage from The River War, Churchill’s second published book. The text is arresting, insightful, powerfully descriptive, and of enduring relevance. Mohammed Ahmed was a messianic Islamic leader in central and northern Sudan in the final decades of the 19th century. In 1883 the Mahdists overwhelmed the Egyptian army of British commander William Hicks, and Great Britain ordered the withdrawal of all Egyptian troops and officials from the Sudan. In 1885, General Gordon famously lost his life in a doomed defense of the capitol, Khartoum, where he had been sent to lead evacuation of Egyptian forces. The Mahdi died in 1895, but his theocracy continued until 1898, when General Kitchener reoccupied the Sudan. 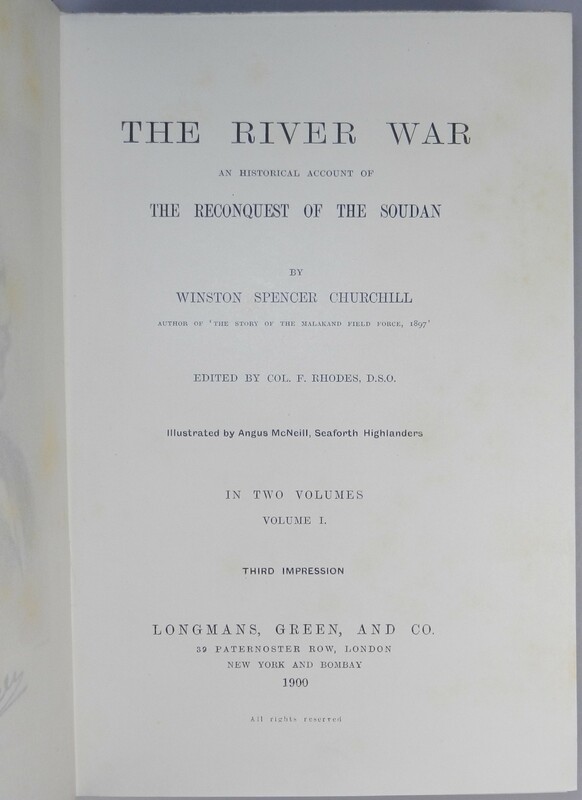 With Kitchener was a very young Winston Churchill, who would participate in the battle of Omdurman in September 1898, where the Mahdist forces were decisively defeated. 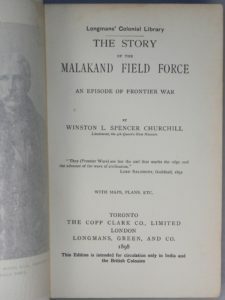 In this book about the British campaign in the Sudan, Churchill – a young officer in a colonial British army – is unusually sympathetic to the Mahdist forces and critical of Imperial cynicism and cruelty. 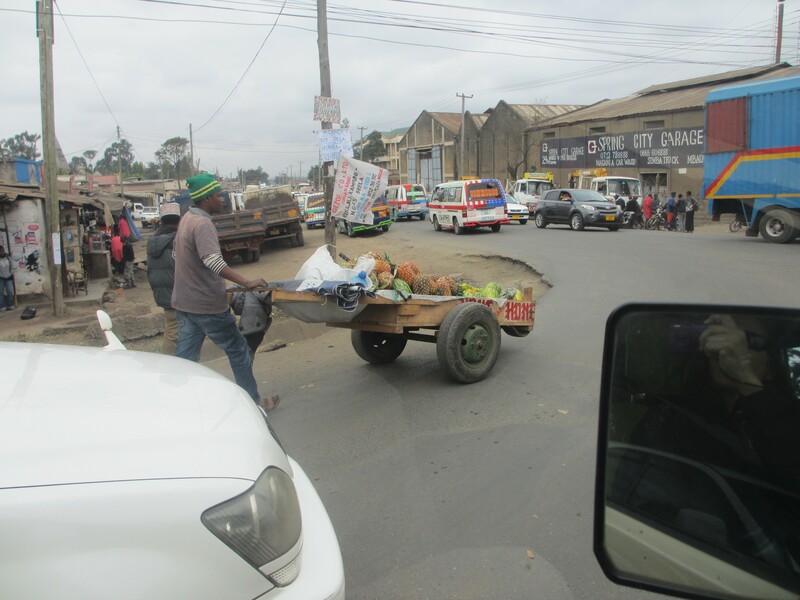 Nevertheless… they rode unflinchingly to certain death…. 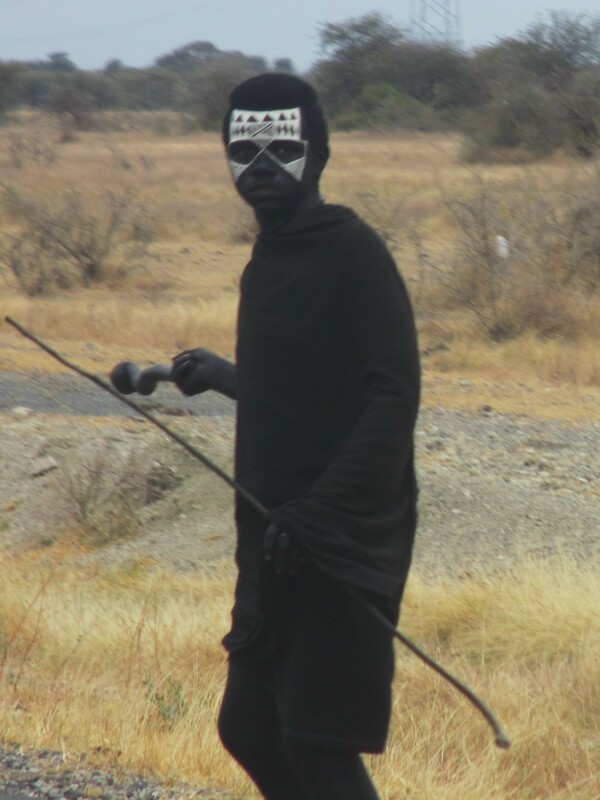 ‘Mad fanatacism’ is the depreciating comment of their conquerors. I hold this to be a cruel injustice…. Why should we regard as madness in the savage what would be sublime in civilised men? No doubt – Churchill could be nakedly ambitious, fiercely partisan, and relentless in pursuit of a policy or cause. But even in Churchill’s early works there always seems to be an underpinning sense of balance. Ultimately, he always seemed able to reconcile a perspective broader – and sometimes fundamentally different – than his own. As he did that on the battlefield at Omdurman, so too he did it even in his first years in Parliament. 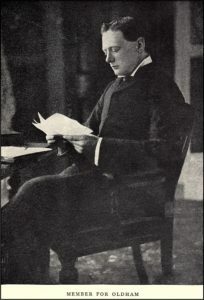 Free trade was a significant issue in Churchill’s early career – one of the policy issues that led to his break with the Conservative Party in 1904. In this passage from his 1906 book of speeches on the subject, note how his support for the issue – vigorous enough for him to publish an entire book on the subject – is nonetheless tempered and nuanced. 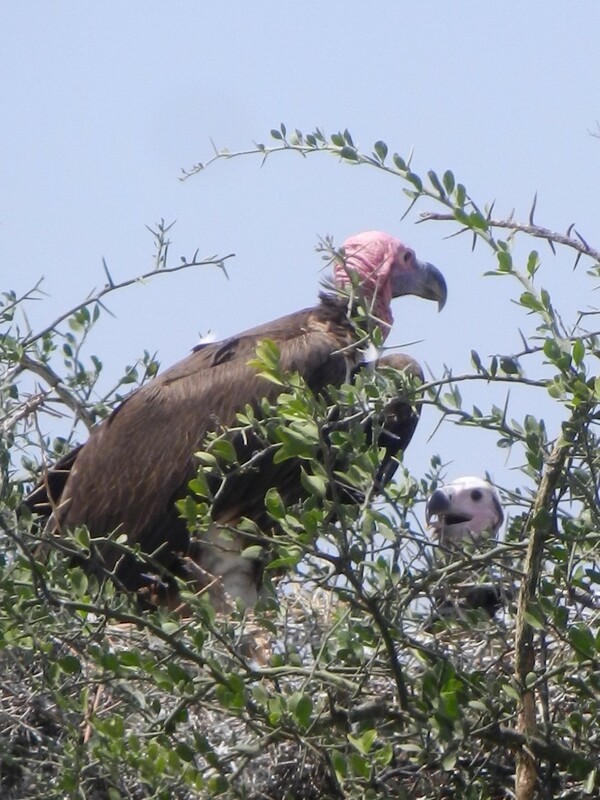 “There is another danger which we must not overlook. but it is not progress. Something more than that is needed. Free Trade will never be securely defended by a purely negative policy. 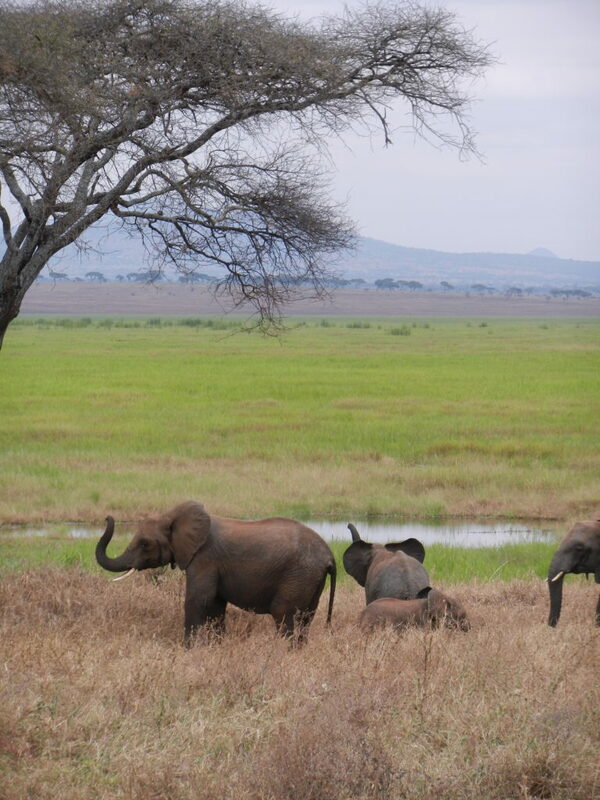 how happy, how wealthy, how contented, how luxurious we are. Which brings me to a suitable prop. This is another pencil cartoon by Edward Tennyson Reed, but this one is the original drawing from 1908 in a circa 1930s frame. Churchill was 33 years old. He had been the Liberal Member of Parliament for Manchester Northwest since the 1906 General Election, but was forced to stand again for the seat in 1908, following his appointment as President of the Board of Trade – a Cabinet post. Churchill lost the election to the Conservative candidate largely because of his support of Free Trade. I love this cartoon. The western apparel and motif plays on the fact that Churchill’s mother was American and deftly cues Churchill’s brash, maverick nature. 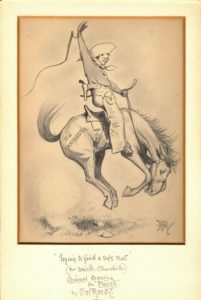 Churchill would be bucked many times by public opinion – and just as many times he would climb right back in the saddle. proceeding far more rapidly than the development of his nobility. Even the unflappable Gandhi was pricked and goaded. As were most who suffered – deservedly or not – the scourge of Churchill’s tongue and ink. It would be Joseph’s son, Neville Chamberlain, who Churchill would in turn savage, serve with, and then magnificently eulogize more than 30 years later. It may be no credit to Churchill that he was, in fact, paraphrasing W. C. Fields. In the interests of history, I should point out that Churchill was just tired, not drunk, and Bessie – well Bessie really was not a pretty woman. 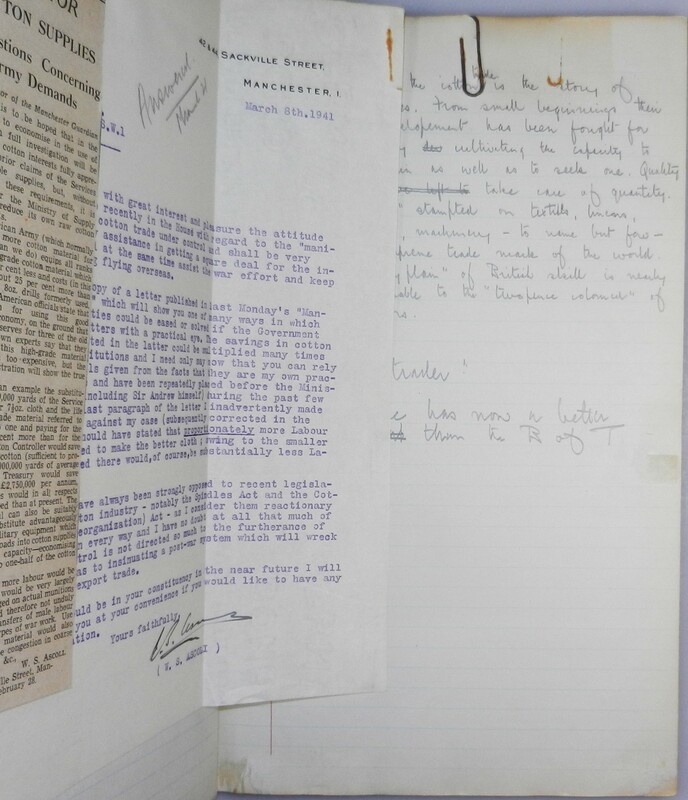 The letter I’m going to pass around is from March 7th, 1949 from Churchill to his publisher, Desmond Flower. 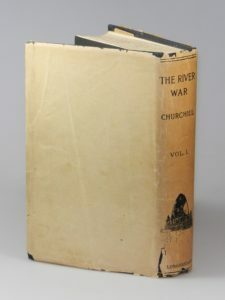 Flower’s father, Newman, had secured what was called “perhaps the greatest coup of twentieth century publishing.” This was, of course, the rights to Churchill’s Second World War Memoirs. But landing Churchill had its price. Monetary and otherwise. 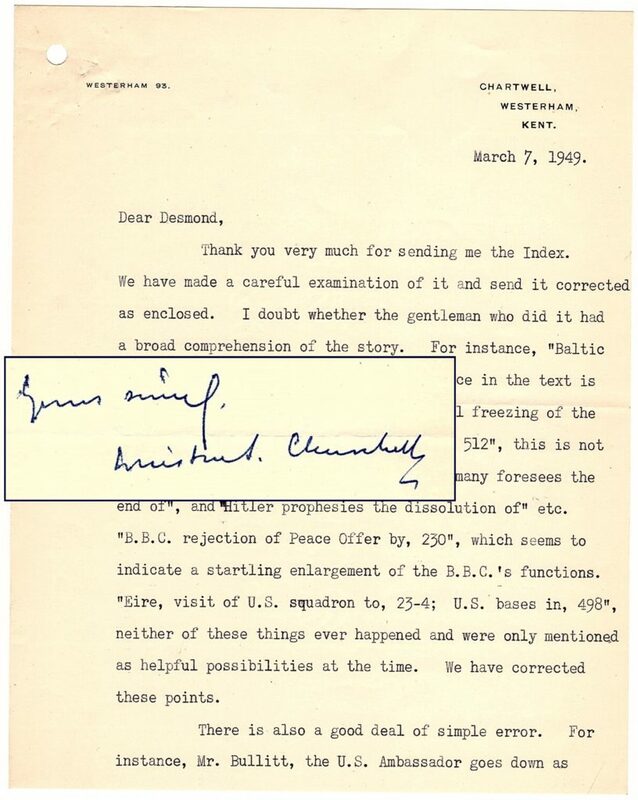 In this two page letter, Churchill – who had an entire literary team mind you – personally offers quite granular corrections. To the Index of the second volume. You can picture the hapless publisher and his editorial staff being micromanaged and scolded by an author of Churchill’s stature – one they can neither control nor do without. never surpassed in the dark, lamentable catalogue of human crime. Let that be realised; no survival for the British Empire; no survival for all that the British Empire has stood for, no survival for the urge and impulse of the ages, that mankind will move forward towards its goal. But I take up my task with buoyancy and hope. I feel sure that our cause will not be suffered to fail among men. are turning the tide of the world war by their prowess and by their devotion. 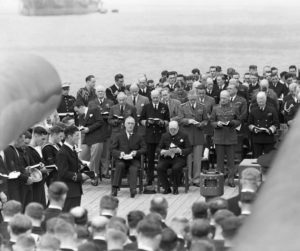 The end of the war brought deep disappointment to Churchill, but no lessening of either his vision, his commitment, or of the words he brought to bear to in support of both. Even though he was no longer prime minister, Churchill’s words were still essential to framing both the dangers of conflict and opportunities for peace vying for mastery in the postwar landscape. “I cannot pretend to feel impartial about the colours. I rejoice with the brilliant ones, and am genuinely sorry for the poor browns. in painting, and so get to the bottom of the subject. But then I shall require a still gayer palette than I get here below. Churchill was undoubtedly a creature of extravagant confidence, sometimes bordering on hubris. But it was his perpetual sense of history that imparted a tempering humility and grace to his words. For better or worse, Churchill lived long enough to become an icon. By the final years of his second premiership, he became “a living national memorial” of the time he lived and the Nation, Empire, and free world he served. Perhaps, after a life of strife and vigorous opposition, he enjoyed the accolades. But even these he accepted with his characteristic sense of the history with which his life had become entwined. 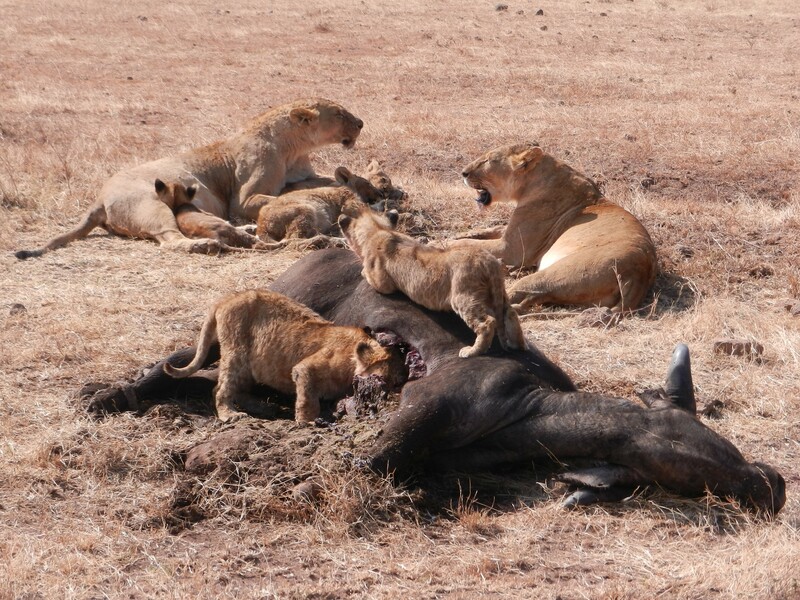 It was a nation and race dwelling all round the globe that had the lion heart. They might also have said: Never in the field of human endeavor has so much history been written by one who made so much history. Churchill wasn’t just prolific. He was a gifted writer with a distinctive voice. All of the sharp wit, incisiveness, rolling cadences, sweeping sense of history, and unusual foresight that marked his life permeate his writing. Even so, history offers many prolific and talented wordsmiths. What sets Churchill apart? Churchill’s extraordinary life is what so compellingly infuses both his writing and his enduring persona. Churchill doesn’t just tell a great story, he is a great story. Since most of what he wrote about were events and issues and people and places central to his life, Churchill’s words reinforce and perpetuate his singularity. Often the writings of a great statesman are just a polished literary headstone, secondary to a life spent in pursuit and exercise of power. Churchill’s life was writing. He wrote before he achieved power. He wrote after power passed from his aging hands. Words were his personal currency and daily essential. Of course he wrote for practical purposes. He wrote to sustain himself and his family. He wrote to persuade and influence and assert. But he also wrote as if words were not just a tool, but a compulsion, a part of him that he was driven to exhale onto page after endless page. During the course of his long life Churchill left on paper perhaps more published work – and more that was revealingly himself – than any other great statesman. So what did Churchill use all these words for? Now we come to leadership. In this same letter, Churchill also wrote: “I think a keen sense of necessity of burning wrong or injustice would make me sincere…” Churchill had recently seen his first active service and had conspicuously distinguished himself on a bloody battlefield. 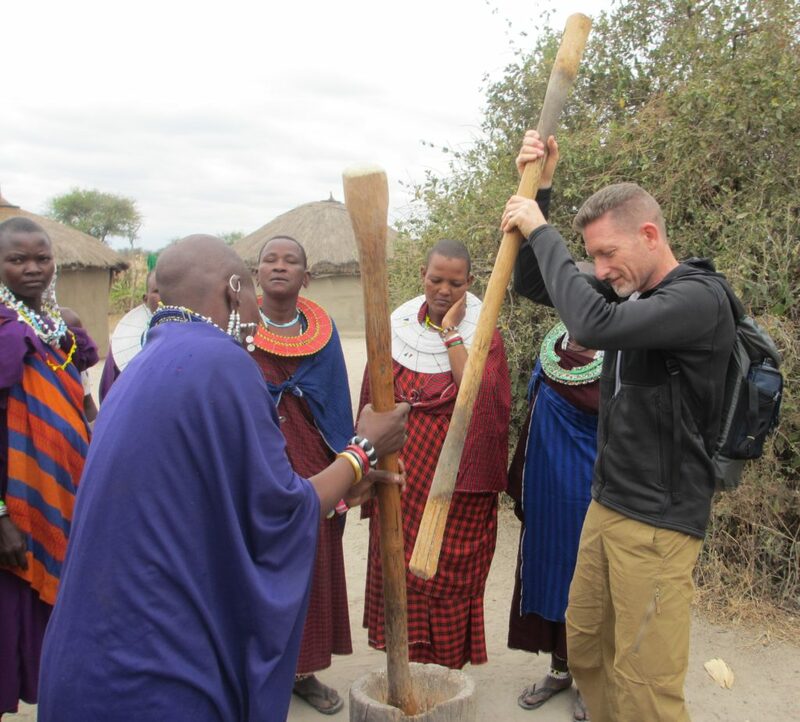 He spoke of crying when he met a unit of his fellow soldiers who had become unsteady under fire and abandoned their young officer, who was killed as a result – quite “literally cut in pieces”. To Churchill’s credit, he cried both for the steadfast officer who fell and the faltering men who abandoned him. He closed his letter musing “…I believe that [in essence] I am genuine…” and tried to define the interplay between his head and his heart. This very young Churchill was impetuous, insatiably ambitious, and unreasonably brave. He was flexing and experimenting with words, just as he was testing and proving his mettle. The “Great Causes” of which he spoke would find him. And find him ready. Churchill’s words would ultimately shape him as much as they shaped the world he sought to engage and influence. Churchill used words to encapsulate and project a vision not just of the world as he saw it, but the world as he wished it to be. It may be impossible to have a conversation about Churchill and leadership without discussing the Second World War. So I will steer into the curve. I’ll talk about two things. First, Churchill’s stirring wartime eulogy of Neville Chamberlain early during the war and second, the history of the war Churchill wrote in its aftermath. Churchill became Prime Minister in May 1940. Throughout the 1930s he had sounded the alarm and both labored to avert the coming conflict, while also preparing his nation to prevail should it become unavoidable. We see the Second World War now as a dominant, irrevocable landmark in the geopolitical topography of the twentieth century. But in a world barely a generation away from the numbing, unspeakable carnage of the First World War, another such war seemed inconceivable. And those who prophesied readiness and resolve were shunned. We see Churchill as the inevitable leader for the time. But at the time he was out of power and out of favor, reduced to appealing directly to the public through his writing and speeches, and to working indirectly through sympathetic allies in the bureaucracy and back benches of Parliament. Indeed, it was the leadership of his own Conservative Party that was perhaps most responsible for ignoring and ostracizing Churchill. Are you all OK with one last prop? I have 8 or 9 minutes of talking left, but I also have one more prop that will take a minute or so to present. It’s up to you… But I have to say that it is a pretty cool item. 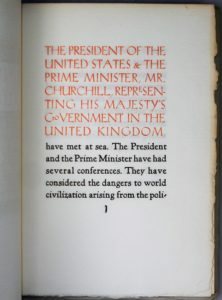 This is a textually unique, bibliographically unidentified edition of Churchill’s October 16th, 1938 broadcast address to the American people about the Munich Agreement. It may seem odd that Churchill – merely a Member of Parliament and representative of neither his Party nor his Government – would address the people of the United States. The fact is that Churchill’s tireless campaigning for prudent rearmament and collective security had given him an independent voice and audience. And Chamberlain’s Munich concession to Hitler turned Churchill’s long running disagreement with Chamberlain into an open breach. So by this time, it was almost as if Churchill was Leader of the Opposition, despite sharing the party of the sitting Prime Minister. 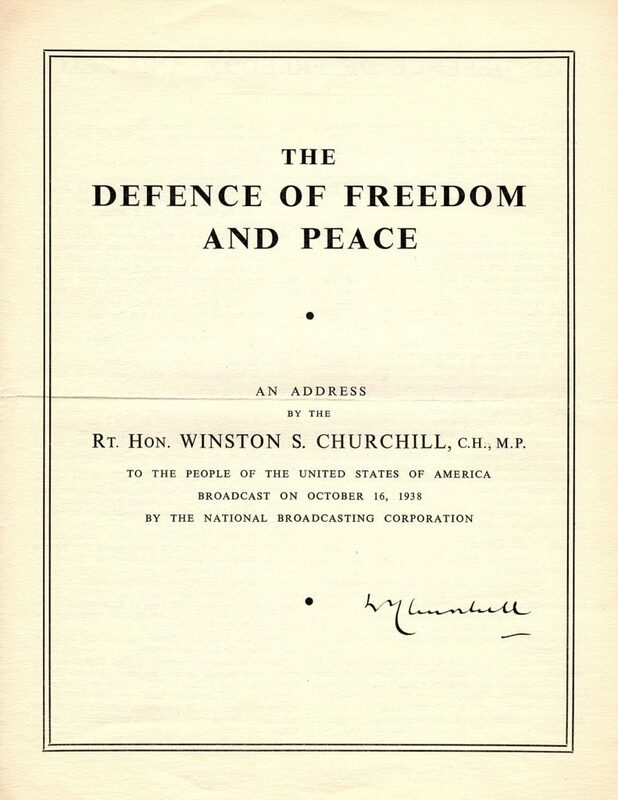 Churchill used his personal platform to appeal directly to the American people with a strikingly blunt assault on the moral and strategic infirmity of the Munich agreement and a clarion call for preparedness. No other contemporary stand-alone publication of this speech is known. This pamphlet is definitively contemporary, evidenced by accompanying Chartwell stationery printed: “19th November 1938 | With Mr. Churchill’s compliments.” Moreover, it is boldly signed by Churchill on the front cover. But most interesting is the fact that this pamphlet appears likely to have been printed from a late-stage version of Churchill’s speech notes prior to delivery of the speech. 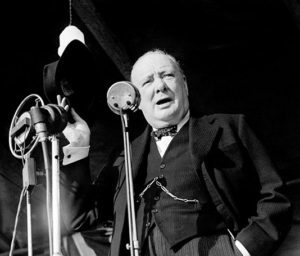 Churchill is known to have made emendations and revisions to his speeches up until the final moments preceding delivery – including this specific speech. 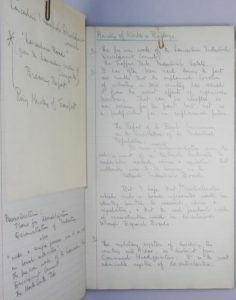 Courtesy of The Churchill Archives Centre, we reviewed Churchill’s original hand-corrected speech notes. 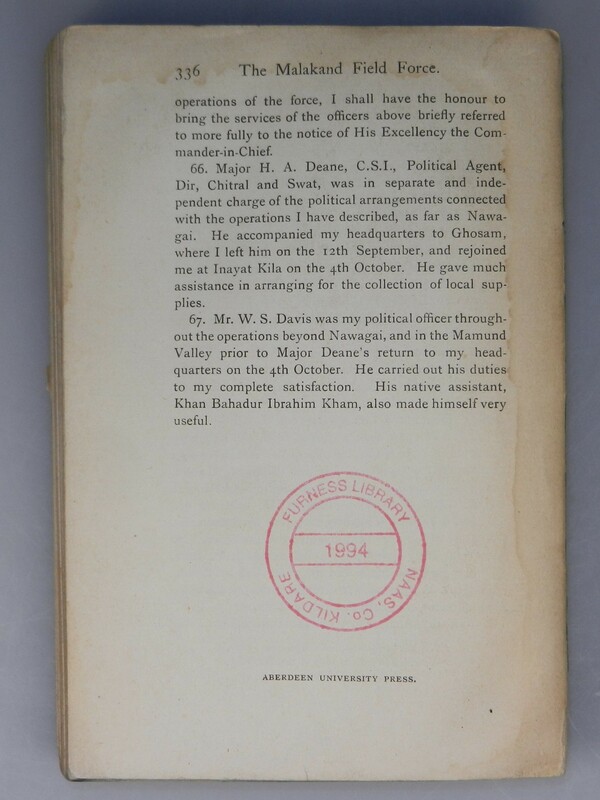 We found a number of Churchill’s personal emendations to the speech as delivered which are not incorporated into this printed pamphlet. Most significant is the conclusion. A substantial five-sentence passage – essentially the “hard-sell” to the American people, beginning with the line “Far away, happily protected by the Atlantic and Pacific Oceans, you, the people of the United States…” – appears as the final paragraph in this pamphlet. But this critical paragraph was relocated closer to the mid-point of the speech when delivered. This pamphlet is not just an amazing collectible item, but a tangible reminder of how very personally Churchill grappled with the words he bent to his purpose. Not until Hitler invaded the Low Countries and France did Chamberlain lose the confidence of the House of Commons – and lose 10 Downing Street to Churchill. But Churchill kept him on in the government. The two men worked with shared purpose until cancer forced Chamberlain’s resignation. As a piece of moving oratory, for my money Churchill’s eulogy of Chamberlain stands beside the famous funeral oration of Pericles from fifth century B.C. Athens. What most distinguishes it is perhaps a tremendous humanity and humility. Humanity in the sense of a generosity of spirit, a comprehending empathy. And in so clearly recognizing decency in the midst of tragic error, a fundamental humility of intellect and sentiment. This from a man not often recognized for humility. We see these essential qualities of a comprehending humanity and humility threading the war and its aftermath, and indeed even the earliest years of Churchill’s political life and thought. Of course when Churchill was done making history, he felt compelled to write it. His six volume history of the Second World War was published between 1948 and 1953. 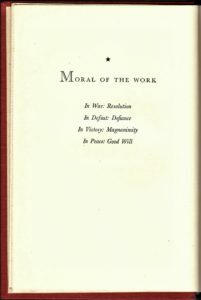 When Volume I was published in 1948, Churchill put his “Moral of the Work” prominently and alone on the page immediately following the author’s Acknowledgements. The boy who had professed not to care so much for principles more than 50 years earlier on the battlefields of colonial India had very much clarified his moral framework. In a cynical post-war world slipping inexorably into a new Cold War, perhaps some considered it banal – or at least overly simplistic – to ascribe a moral to the greatest conflict the world had yet seen. Churchill did not. Likely better than most, he well understood the often senseless and bloody chaos and vagaries inherent to the human condition. Precisely “because we are so often mocked by the failure of our hopes and the upsetting of our calculations” did he recognize the vital role of purposeful resolve, reasoned defiance, and generous decency in public affairs – of that “rectitude and sincerity” in personal conduct for which he eulogized Neville Chamberlain.. The “Moral” testifies to both Churchill’s own statecraft and to the failures of statecraft that precipitated the Second World War and would unfortunately persist in its wake. The words also trace a vital arch underpinning Churchill’s political thought and character and spanning his public life. The guiding sentiments encapsulated by the “Moral” allowed Churchill – for all his reputed pugnacity – to achieve farsighted perspective and bridge material, empathetic, and intellectual differences throughout his long life. According to Churchill’s Private Secretary, Eddie Marsh, Churchill first composed what became his “Moral of the Work” soon after the First World War as an “epigram on the spirit proper to a great nation in war and peace.” Churchill was asked to devise an inscription for a war monument in France. He submitted exactly the same words that would become the “Moral of the Work” in his history of the Second World War. It is deeply sad that the inscription was not accepted. The rejection is, in fact, a perfect commentary on the failures of the victors to secure the post-WWI peace, thus ultimately precipitating the Second World War that followed. is essential to our own peace and prosperity. Churchill’s warnings would be substantially ignored by the victors. Fourteen years later a defeated and desperate Germany would elect Adolph Hitler. It is interesting to note that many have criticized Churchill for moral flexibility, for changing his fundamental tenets and principles over time to suit circumstance. Superficially, one can see how such a view proliferated. First, he was in public life for a tremendously long time – allowing him to participate in an incredible variety of public decision, including two world wars. Second, he was a strong personality, attracting a considerable variety and intensity of detractors over time. But, as evidenced by the decades of consistent political thought underpinning the Moral of the Work we just discussed, what is most remarkable about Churchill is not his malleability, but quite the opposite – his constancy. My own words will be less eloquent than those of either Churchill or Isaiah Berlin. I would say that Churchill comprehended the broad sweep of history as few leaders before or since. History was not a curriculum he consulted or a weight he bore. It was a current to which he committed himself. Which he ruddered and rode. Navigated and became. And words – a torrent of words – evocative, emotional, reasoning, reckoning – were his constant companion. Churchill’s words charted his course, gave polarity to his compass. So again, why are we here tonight discussing this particular British prime minister? Because he shows us what we can do. What we can do. 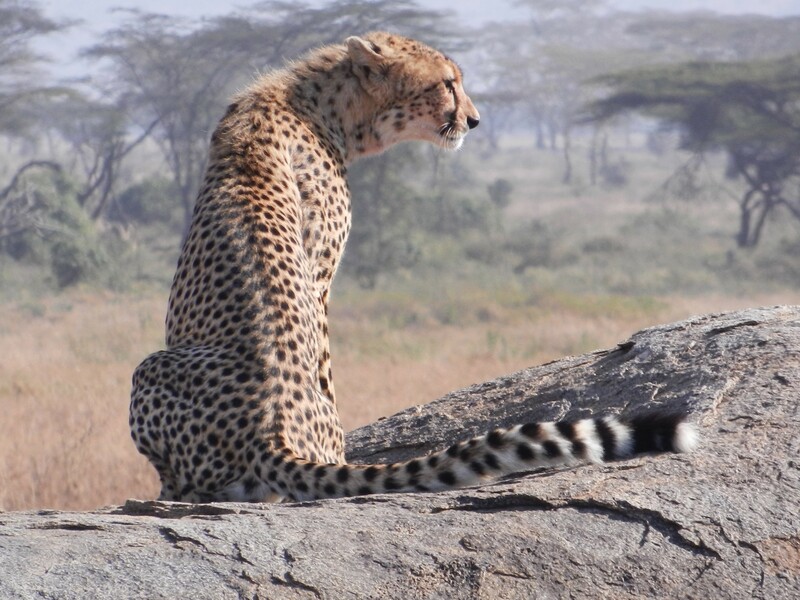 How we humans can strive and be magnificent, despite every failure, fault, and folly. And he tells us in his own powerful, compelling words. There is no way to know this man better – to see him, our world, and ourselves the way that he saw – than to read his own words. So I commend Churchill’s words to you, and I thank you for inviting me speak with you this evening. 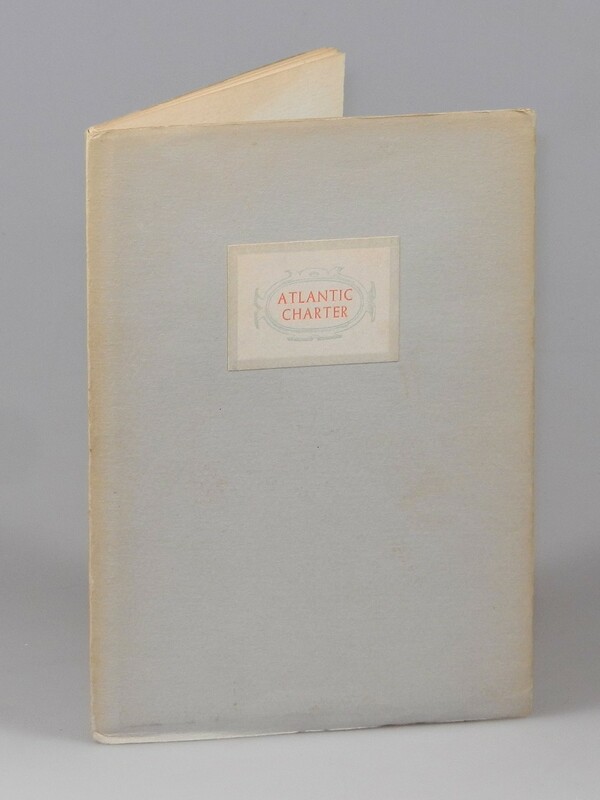 We are pleased to have recently discovered 1942 limited and numbered edition of The Atlantic Charter. This is the only copy we have encountered of this edition and is a certifiable NIC. That’s short for “Not in Cohen”. 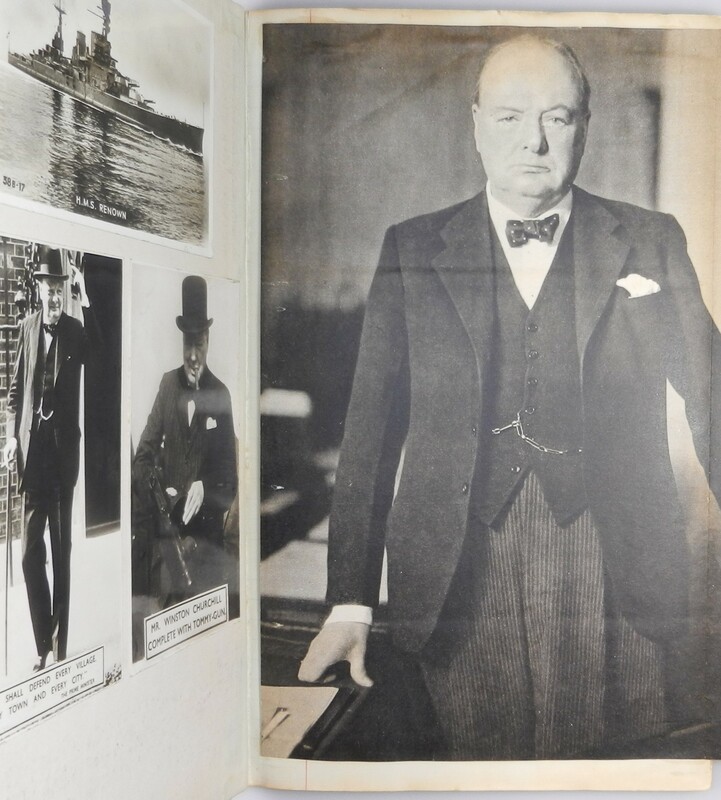 Nearly 25 years of exhaustive research went into Ronald I. Cohen’s indispensable three-volume, 2,183 page Bibliography of the Writings of Sir Winston Churchill. No less an authority than Sir Martin Gilbert effusively praised Ron’s work, calling it: “…a high point – and surely a peak – of Churchill bibliographic research… adding not only to the bibliographer’s art, but to knowledge of Winston Churchill himself.” Published in 2006, Ron’s Bibliography seeks to detail every single edition, issue, state, printing, and variant of every printed work authored by, or with a contribution from, Winston S. Churchill. Take it from a professional bookseller – even in the characteristically thorough world of bibliographies, Ron’s stands out. So the rare occasions when we discover a work by Churchill unknown to Ron – an NIC – it is cause for pardonable bit of bibliophilic fanfare. 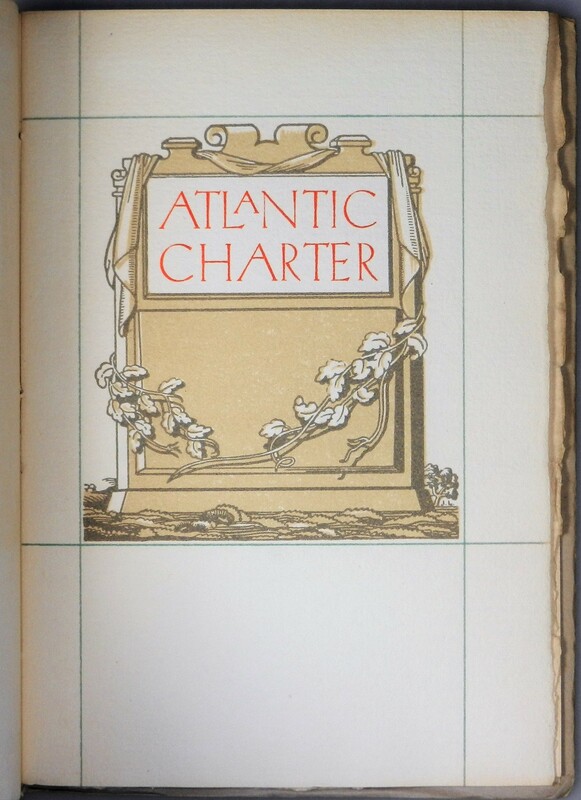 Hence our excitement about this edition of the Atlantic Charter. This diminutive but quite attractive book measures 7 x 5 inches, bound in dove gray paper covered card boards with a white front cover title label printed gray and red, the gray paper affixed by flaps secured beneath the pastedowns. The contents are printed in black and red on watermarked, laid paper with untrimmed edges. 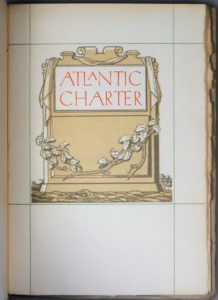 Eight pages reproduce the eight points of the Atlantic Charter, followed by an illustrated limitation page and preceded by an illustrated title page. 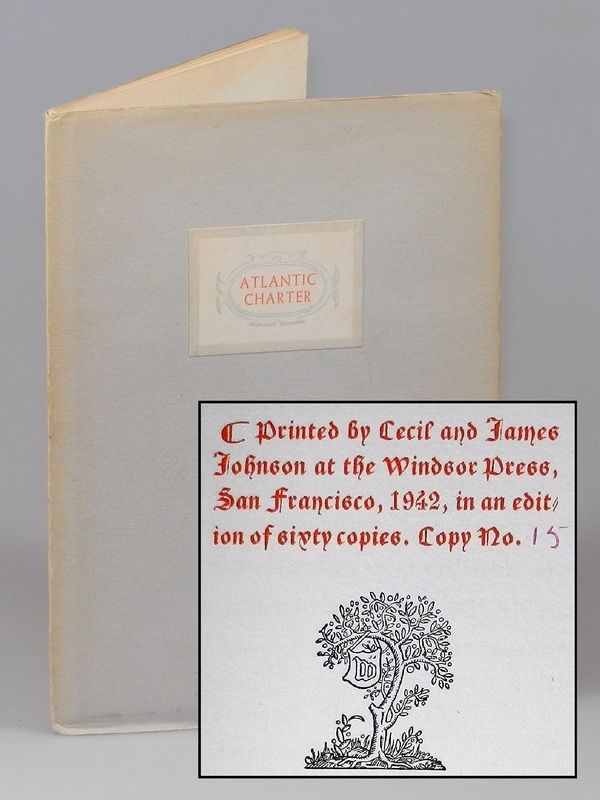 The limitation page reads: “Printed by Cecil and James | Johnson at the Windsor Press, | San Francisco, 1942, in edit | ion of sixty copies. Copy No. 15”. The limitation is hand-numbered in red ink. The Windsor Press was established in San Francisco in 1924 by the Australian brothers, James and Cecil Johnson, with James as designer, typographer, and pressman and Cecil as manager. 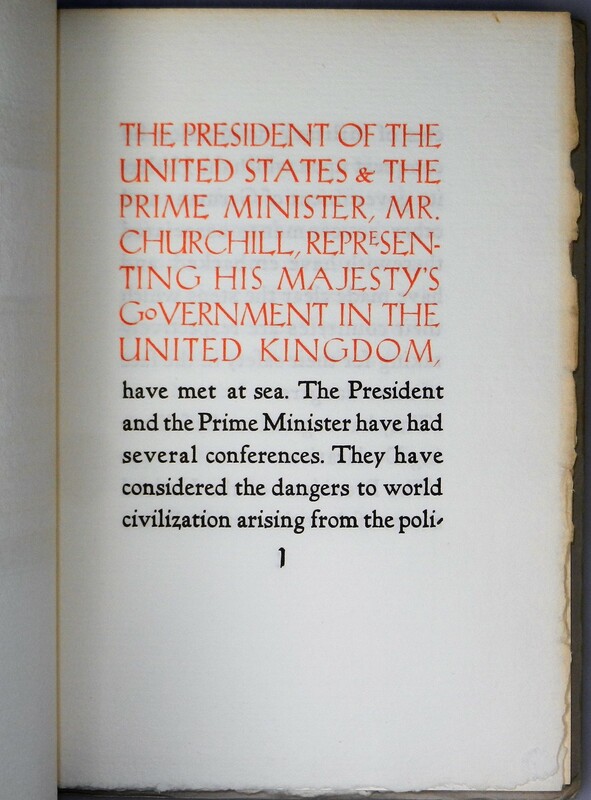 The beautiful, limited edition was quite plausibly printed for the first anniversary of the Atlantic Charter in 1942, which President Roosevelt marked with a 14 August 1942 message to Churchill reaffirming commitment to the principles of the Atlantic Charter. In August 1941, Winston Churchill had braved the North Atlantic seas during the Battle of the Atlantic to voyage by warship to Placentia Bay, Newfoundland, where he met President Franklin D. Roosevelt for a remarkable secret conference from the 9th to the 12th. Part of their agenda included an effort to set constructive goals for the post-war world, even as the struggle against Nazi Germany and Imperial Japan was still very much undecided and the U.S. had yet to formally enter the war. The eight principles to which they agreed became known as the Atlantic Charter. ATLANTIC CONFERENCE BETWEEN PRIME MINISTER WINSTON CHURCHILL AND PRESIDENT FRANKLIN D ROOSEVELT 10 AUGUST 1941 The President of the United States and the Prime Minister of the United Kingdom are seated on the Quarterdeck of HMS PRINCE OF WALES for a Sunday service, during the Atlantic Conference, 10 August 1941. In the row behind them, left to right: Air Chief Marshal Sir Wilfred Freeman; Admiral E J King; USN; General Marshall; General Sir John Dill; Admiral Stark, USN; Admiral Sir Dudley Pound. 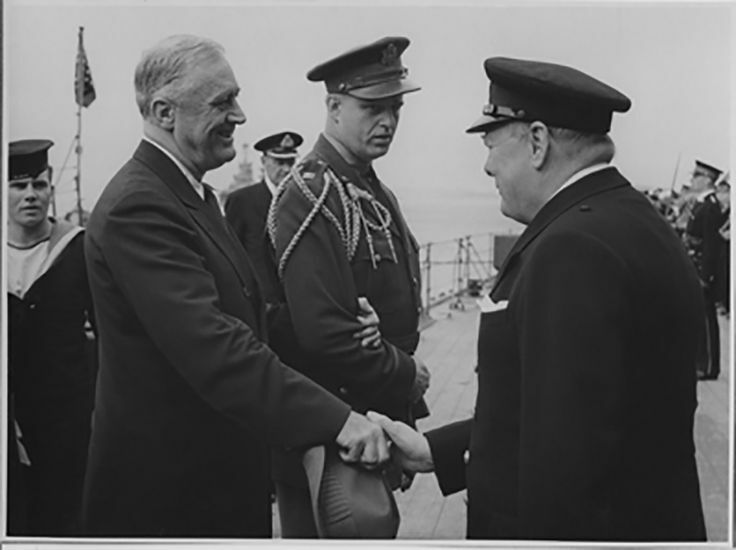 In addition to encapsulating the postwar aspirations of the Allies and catalyzing formation of the United Nations, the Atlantic Charter also testifies to perhaps the most remarkable personal relationship of the Second World War, that between Franklin Roosevelt and Winston Churchill. The President of the United States and the Prime Minister, Mr. Churchill, representing H. M. Government in the United Kingdom, being met together, deem it right to make known certain common principles in the national policies of their respective countries on which they base their hopes for a better future for the world. Their countries seek no aggrandisement, territorial or other. They desire to see no territorial changes that do not accord with the freely expressed wishes of the peoples concerned. They respect the right of all peoples to choose the form of Government under which they will live; and they wish to see sovereign rights and self-government restored to those who have been forcibly deprived of them. They will endeavour with due respect for their existing obligations, to further enjoyment by all States, great or small, victor or vanquished, of access, on equal terms, to the trade and to the raw materials of the world which are needed for their economic prosperity. They desire to bring about the fullest collaboration between all nations in the economic field, with the object of securing for all improved labour standards, economic advancement, and social security. After the final destruction of Nazi tyranny, they hope to see established a peace which will afford to all nations the means of dwelling in safety within their own boundaries, and which will afford assurance that all the men in all the lands may live out their lives in freedom from fear and want. Such a peace should enable all men to traverse the high seas and oceans without hindrance. Nonetheless, the principles of the Atlantic Charter were remote from the realities of war in August 1941. Not until December 1941, after the Japanese attack on Pearl Harbor, did America formally enter the war and not until October 1945 was the United Nations established, embodying the lofty principles of the Atlantic Charter. Even then, the nascent Cold War was already beginning, ensuring that a geo-political reality based on those noble principles would remain as remote as it was in Placentia Bay in August 1941. And as it remains today. Today we write about a truly extraordinary item that will be featured in our forthcoming fall catalogue. This first edition, final printing set of Churchill’s second book, The River War, is not only the sole set known to retain the original dust jackets, but is also signed and dated by Churchill on 25 August 1900, during the period when he was campaigning for his first seat in Parliament. This set comes to us from the collection of Churchill’s bibliographer, Ronald I. Cohen. 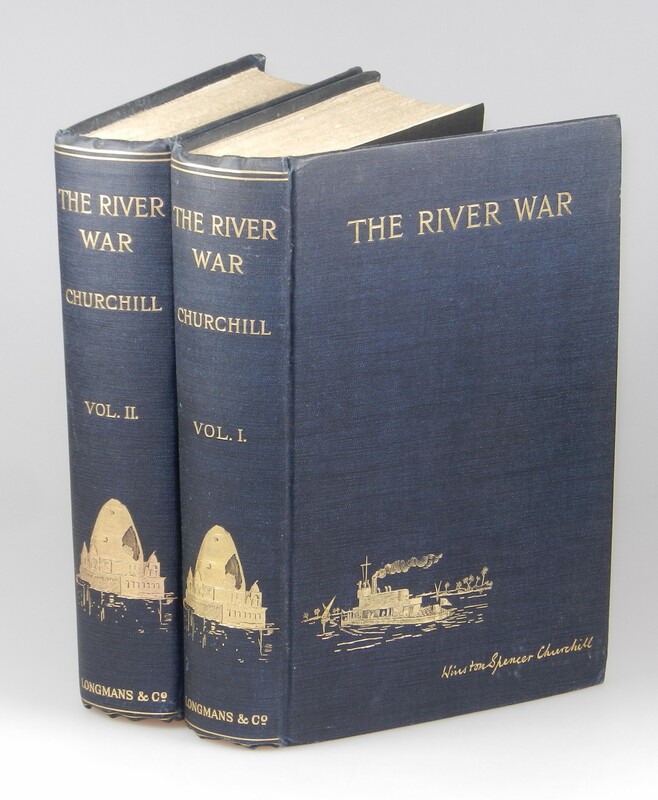 It is difficult to overstate the singularity and appeal of this set which, jacketed and signed, is among the rarest of prizes in the Churchill canon. All the hyperbole we might conceive pertains. These two dust jackets are the only known surviving examples of the dust jackets for the first edition. 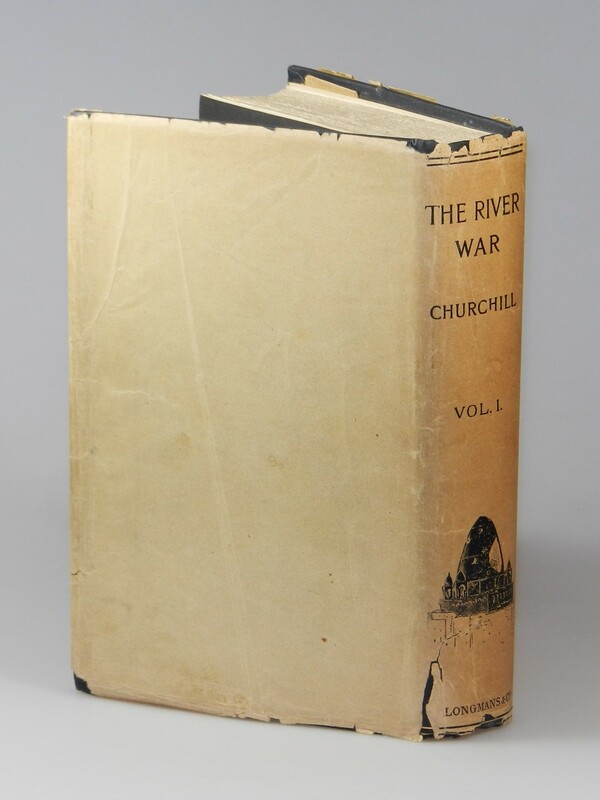 As such, this is the earliest known work by Churchill for which first edition dust jackets survive. covers. The jacket flaps and rear faces are blank. These dust jackets, of course, belong to a first edition, third printing set. Given that the bindings of all three printings are identical, and that only seven months separate the first and third printings, it is probable to the point of near certainty that the dust jackets for all three printings were identical. There is neither reason nor – given that these are the sole surviving examples – data to indicate a contrary conclusion. That these dust jackets are the sole known surviving examples also seems reasonable. At the time of publication, it was customary for booksellers to discard the dust jackets prior to shelving the books for sale. This custom would only have been encouraged by the exceptionally handsome, illustrated bindings of this particular edition. 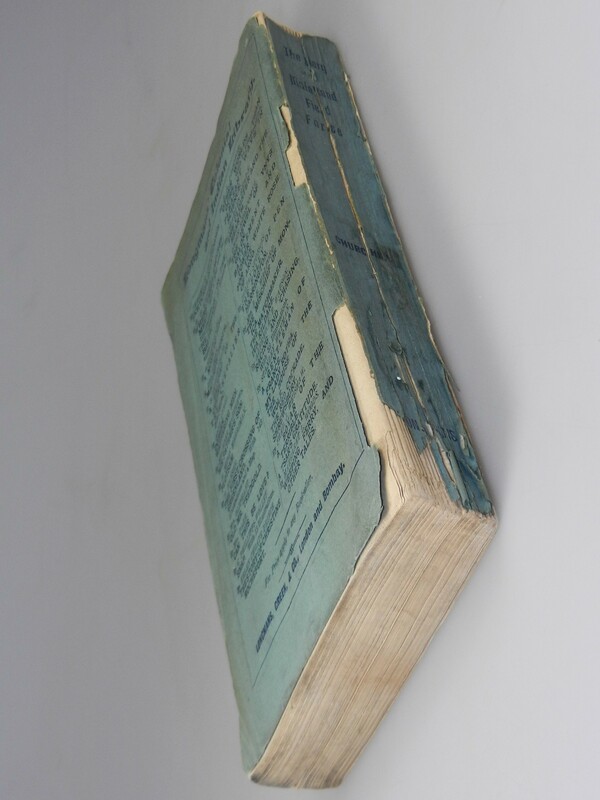 Moreover, the dust jackets are printed on thin stock which, wrapped around these particularly thick and heavy volumes, must have proven quite prone to damage and subsequent discard. The understandable impulse to re-allocate these sole surviving first edition dust jackets to a truly fine first printing set is a temptation that Mr. Cohen laudably resisted, given the magnificent state of these bindings and the fact that this set is also signed and dated by Churchill in the year of publication. 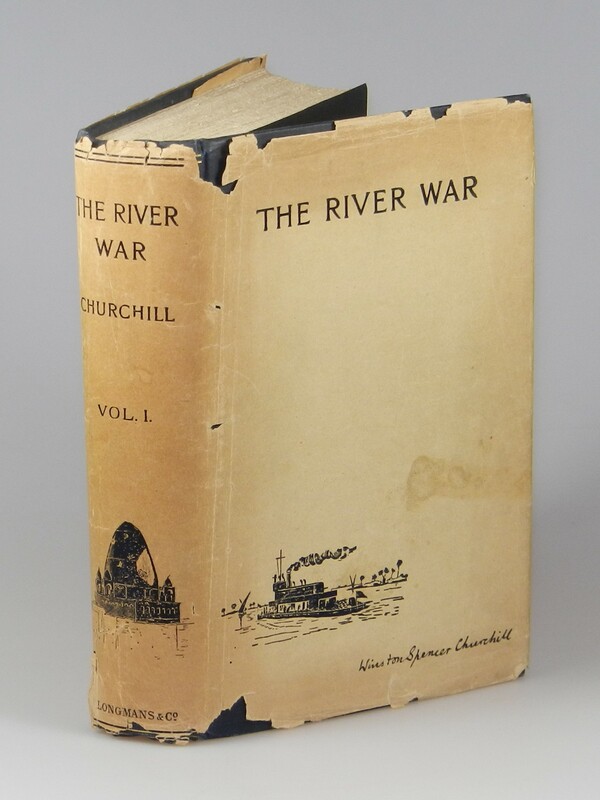 Churchill’s dated signature in The River War would not customarily be an afterthought, but the presence of the original dust jackets makes this set the exception. 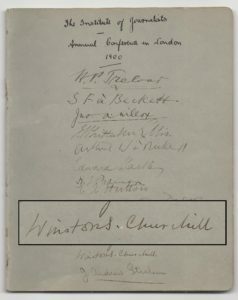 The author’s signature in black ink in two lines on the front free endpaper verso (facing the half-title recto) reads “Winston S. Churchill | 25. August. 1900.” The ink remains distinct, showing minimal age-toning or spreading. 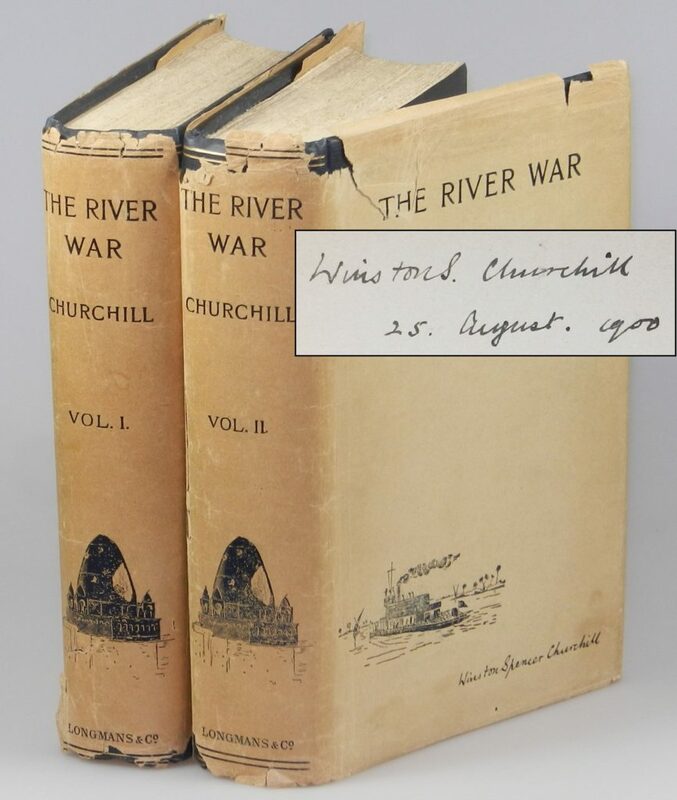 Such early signatures in Churchill’s early works are scarce, and doubly so when dated. Though he would become one of the great leaders of the 20th Century, it was a still markedly Victorian Churchill who signed and dated this quintessential 19th century work at a time of momentous transition in his life. When Churchill inked his name in this set, he was on the cusp of the political career that would dominate the next six decades of his life and fundamentally shape the world he occupied. Nearly all of the accomplishments that made Churchill an indelible part of history lay ahead of him when he signed this set of books. On 25 August 1900, the day this set of The River War was signed, Churchill was just 25 years old, campaigning hard in Oldham, where he would win his first seat in Parliament on 1 October 1900. On Saturday, 1 September 1900, Churchill wrote again to his mother: “I enclose a report of my Beverly speech wh[ich] was about the best platform effect I have ever produced. I flattened out all the interrupters in the end to the delight of the audience…. I go to Paris Sunday afternoon with Sunny.” The “Sunny” to whom Churchill referred was his cousin, the Duke of Marlborough, with whom, along with Ivor Guest, Churchill went to Paris for a few days to the International Exhibition. 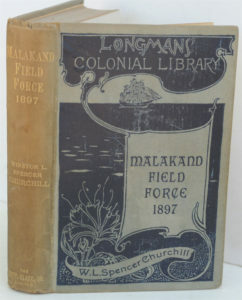 Thirty-seven days after he inscribed this set on the hustings in Oldham, Churchill won his first seat in Parliament partly on the strength of his status as a veteran and British hero of the Boer War. Before he took his seat, Churchill made his first lecture tour of the U.S. and Canada, which was intended to improve his finances during a time when Members of Parliament received no salary for their service. The end of Queen Victoria’s 64-year reign would also see Churchill close his 19th-Century career as a cavalry officer and war correspondent adventurer. The Queen’s funeral took place on 2 February 1901 – the same day Churchill sailed from New York on the SS Etruria for England to take the seat he had won in Parliament. 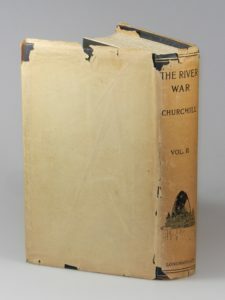 Churchill’s more than six decades-long Parliamentary career – still nascent when he signed this set – would span the Boer War to the Cold War with two world wars in between, and see the world of imperial cavalry charges so vividly recounted in these books almost inconceivably yield to the world of global superpowers and nuclear weapons. Mohammed Ahmed was a messianic Islamic leader in central and northern Sudan in the final decades of the 19th century. In 1883 the Mahdists overwhelmed the Egyptian army of British commander William Hicks, and Great Britain ordered the withdrawal of all Egyptian troops and officials from the Sudan. In 1885, General Gordon famously lost his life in a doomed defense of the capitol, Khartoum, where he had been sent to lead the evacuation of Egyptian forces. Though the Mahdi died in 1895, his theocracy continued until 1898, when General Kitchener reoccupied the Sudan. 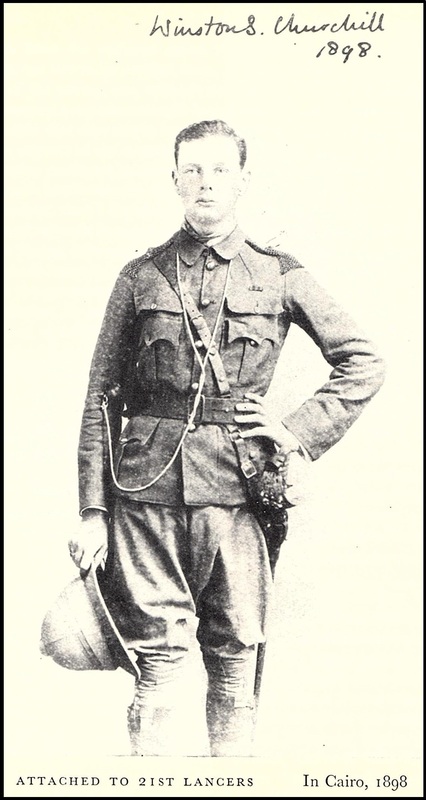 With Kitchener was a very young Winston Churchill, who participated in the decisive defeat of the Mahdist forces at the battle of Omdurman in September 1898. In this book about the British campaign in the Sudan, Churchill – a young officer in a colonial British army – is unusually sympathetic to the Mahdist forces and critical of Imperial cynicism and cruelty. 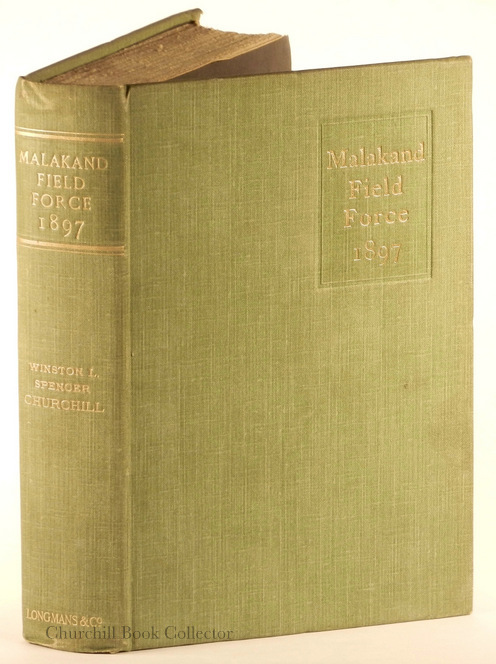 This work offers us the candid perspective of the future great man of the 20th century from the distinctly 19th century battlefields where Churchill learned to write and earned his early fame. Here is a chief architect of the Second World War involved in what has been called the last “genuine” cavalry charge of the British army. This work – and in particular this edition – is as important and desirable as any in the Churchill canon. The two massive volumes of the first edition are compelling in every respect. Aesthetically they are lavish and striking; the two large, weighty volumes are beautifully decorated with gilt representations of the Mahdi’s tomb on the spines and a gunboat on the front covers. 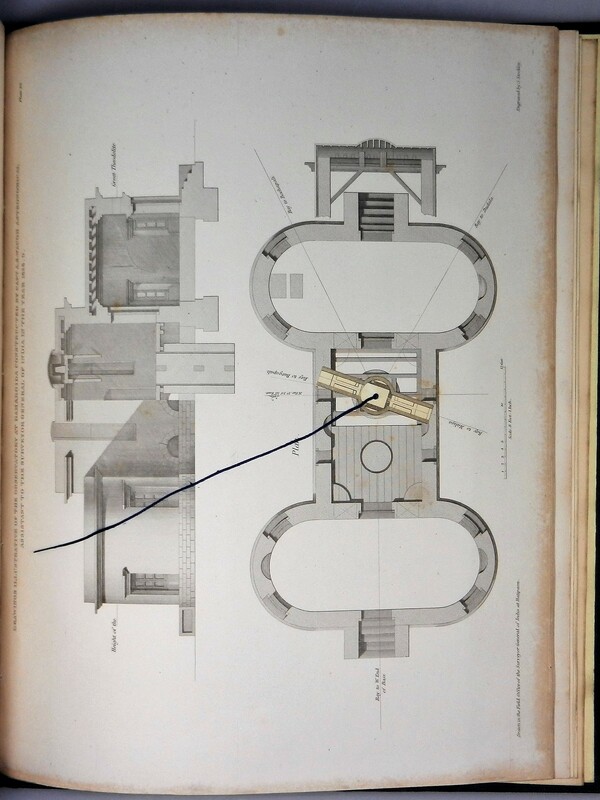 Internally, they are equally appealing, being profusely illustrated with images, maps, and plans. From a collector’s standpoint the edition is scarce; all three printings of the first edition total only 2,646 sets. Last but not least, the text is not only arresting, insightful, powerfully descriptive, and of enduring relevance, but also unique to the first edition, which is the only unabridged edition ever published. In 1902 Churchill (by then more mindful of political exigencies) revised and abridged his text, excising much criticism of Kitchener. All editions published since this third and final printing of the first edition are based on the 1902 abridged text. The overarching context for any description detail is that this set is both jacketed and inscribed, and thus truly singular. Attending to the mundanities of a detailed condition report, we would grade this set as near fine plus in good dust jackets. 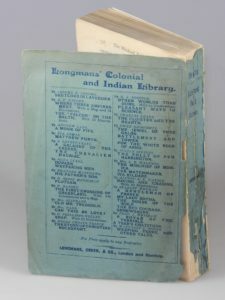 Both dust jackets are substantially complete, with all illustrations and printed text intact, but nonetheless with perimeter losses, overall wrinkling and wear, and minor soiling. The Volume I dust jacket shows losses at the front hinge extremities to a maximum depth of approximately .75 inch, lesser chipping to the balance of the edges, vertical creasing with a few tiny losses at the front hinge, a 1.5 inch closed tear at the lower rear hinge, creasing and closed tears at the flap folds, very light spine toning, and a light stain to the front face. 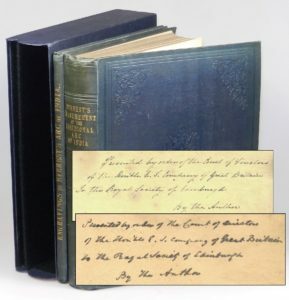 The Volume II dust jacket shows losses at the spine ends to a maximum depth of one inch, lesser chipping to the balance of the edges, closed tears that extend into “THE” in the upper front face title lettering, some splitting and fractional loss along the rear hinge, short tears and minor loss at the flap folds, very light spine toning, and light soiling. Both dust jackets are, of course, protected beneath removable, archival quality clear covers. 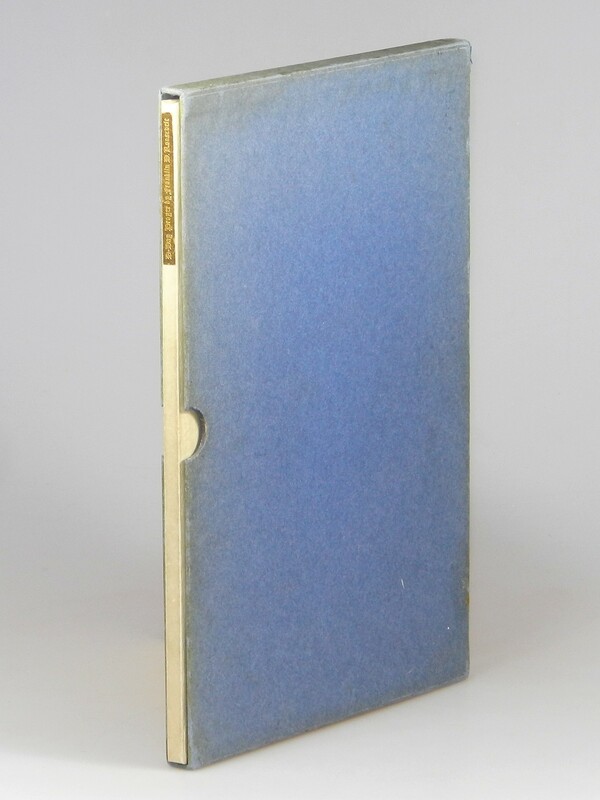 The blue cloth bindings of both volumes are, as one would expect, exceptionally bright and clean, with entirely unfaded color and vividly bright gilt on both the spines and front covers. Volume I, which bears the author’s dated signature, shows a little wrinkling to the spine ends, trivial shelf wear to the lower edges, and bumps to the lower corners. The binding remains fully attached, but a little tender at the front hinge. The Volume II binding likewise shows a little wrinkling to the spine ends, just a hint of mottling of the blue color at the bottom edges, and minor corner bumps. The contents of both volumes remain unusually bright, with modest spotting substantially confined to the prelims and otherwise bright page edges. The original black endpapers are intact, as are all illustrations, maps and plans. All of the folding maps are pristine and properly folded, with no tears or losses. All photogravure portraits, including the frontispieces, are intact, as are their original tissue guards. We find no previous ownership marks other than the author’s Volume I signature. Bibliographic reference; Cohen A2.1.b, Woods/ICS A2(a.3), Langworth p.29. This set has resided in the personal collection of Churchill’s bibliographer, Ronald I. Cohen, for nearly three decades. 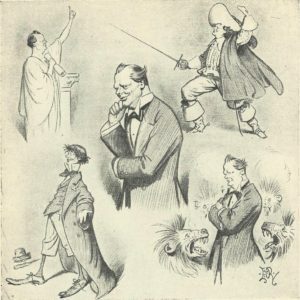 The set was sold by Sotheby’s in the same auction which saw sale of a jacketed first British edition, later printing of Savrola (Churchill’s third published book) signed by Churchill on the same date. 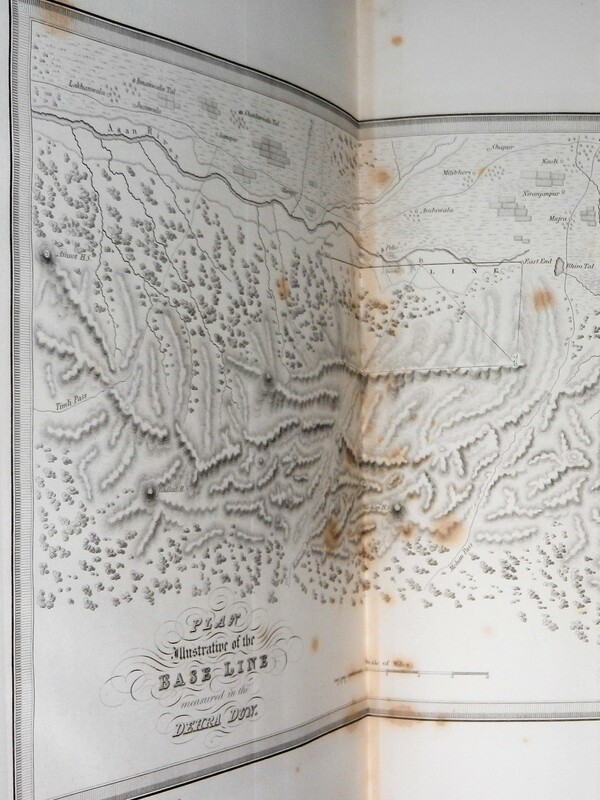 This copy of Savrola is now held by the University of Illinois in its Mortlake Collection. We can reasonably speculate that perhaps both this set of The River War and the companion signed and jacketed Savrola were presented by Churchill to the same Oldham supporter, from whose library they eventually made their way to the 1966 Sotheby’s auction and then eventually to Mr. Cohen (in the case of The River War) and famed British bookseller Harold Mortlake and ultimately the University of Illinois (in the case of Savrola). Our forthcoming catalogue, which should be available in late September, will feature this set among a large number of brand new listings, all noteworthy first edition works by Churchill in original bindings. Please let us know if you will wish to receive a printed copy of the catalogue. I deeply regret posting news of the death of my fellow bookseller and Churchill specialist Mark Weber on Tuesday, 21 June, from complications related to a stroke. We shared abiding respect for Churchill and arcane knowledge of Churchill’s life as expressed through the medium of his words. Churchill has always held my admiration for his ability to couple a deeply sensible irreverence and disregard for convention with genuine and humane respect, which he extended as readily to competitors as to friends. Mark would not have called me a friend and it would be disrespectful for me to pretend otherwise. Nonetheless, I spent so much time over the years poring (often enviously) over Mark’s inventory and catalogues that I feel I must have known him better than many better acquaintances. And of course we corresponded as colleagues and fellow specialists. 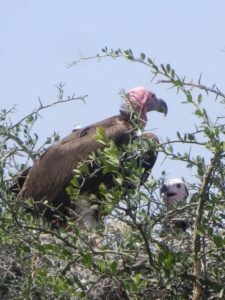 When you occupy the same commercial ground, you sometimes step on one another’s toes. But you can’t effectively curse someone who shares the same first name as you, and I appreciated what he did. Mark was a resourceful and enterprising bookseller for a long time before me. Mark knew his stock well, and he knew our specialty as well as anyone. With Mark’s passing I lose one of the few people on Earth with whom I shared this particular bibliophilic obsession with Churchill’s life and words. I will miss our rivalry. I will miss the conversations we did have about the Churchill canon. Most, I will miss the conversations we will not have. Cheers, Mark! May there be no shortage of books, bibliophiles, and Churchillian wit and mirth where you have gone. 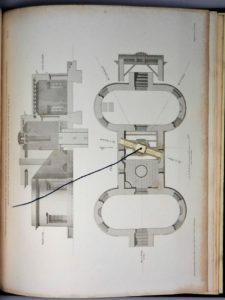 Occasionally, we have the opportunity to catalogue not just books and other publications already known to history, but bits of primary source material that accrete another fragment of information or perspective to the historical record. 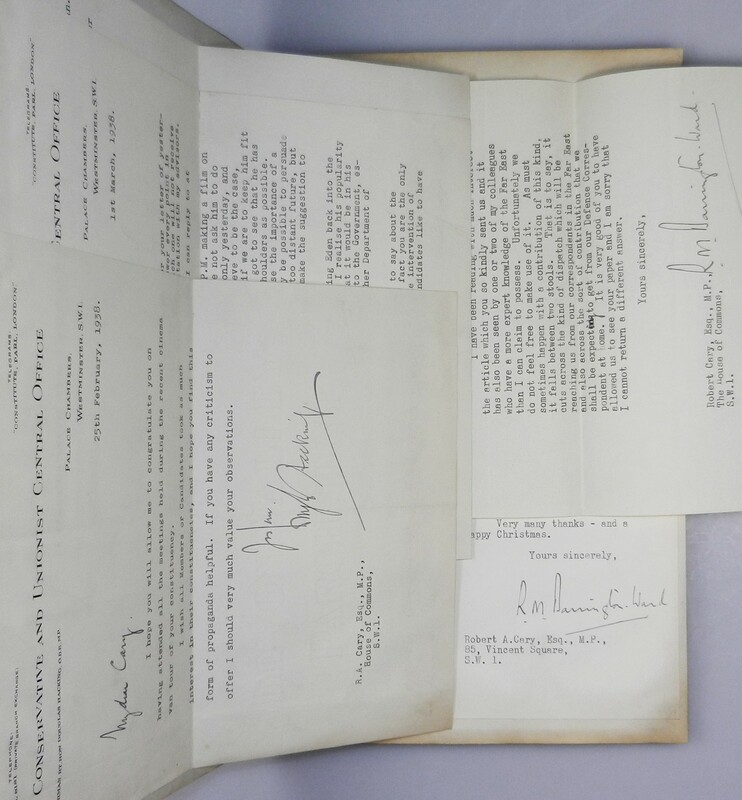 We have just catalogued an archive of Conservative Member of Parliament Sir Robert Cary spanning the late 1930s and the Second World War. 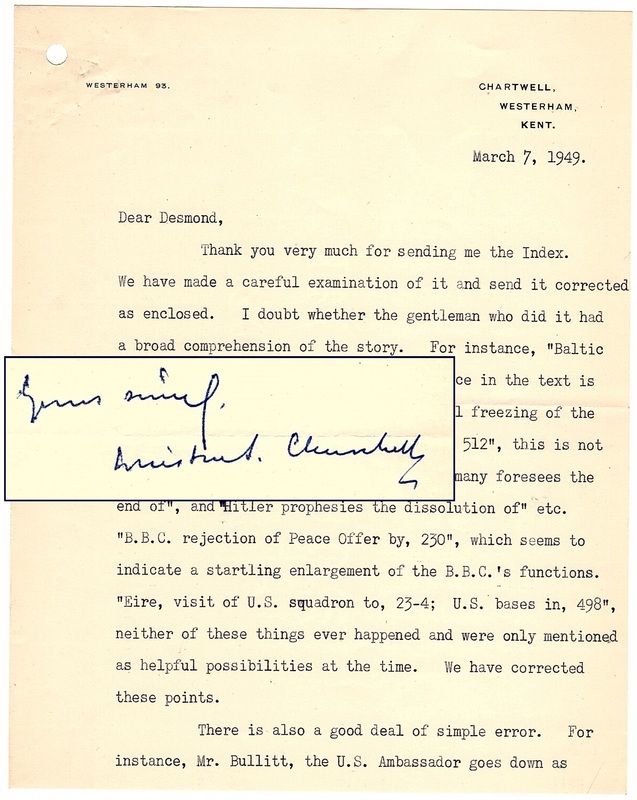 The archive is notable for including a late 1937 typed, signed letter from Winston S. Churchill to Cary about the defense of Singapore, as well as 1938 correspondence about the infirmities of Prime Minister Neville Chamberlain. 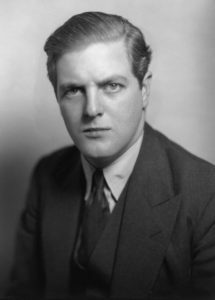 Sir Robert Archibald Cary, 1st Baronet of Withington (1898-1979) was a Conservative politician. He received his education first at Ardingly College, then at the Royal Military College at Sandhurst, as Churchill had done several decades earlier. Cary represented the constituency of Eccles from 1935 to 1945, then the district of Withington in Manchester from 1951 until his retirement in 1974. A veteran of the First World War (fighting with the 4th/7th Royal Dragoon Guards), during the Second World War Cary was parliamentary private secretary to the Civil Lords of the Admiralty from 1939 to 1942, and to the Secretary of State for India and Burma from 1942 to 1945. Upon Churchill’s defeat in the 1945 General Election, Cary was knighted in Churchill’s resignation honours on August 14. 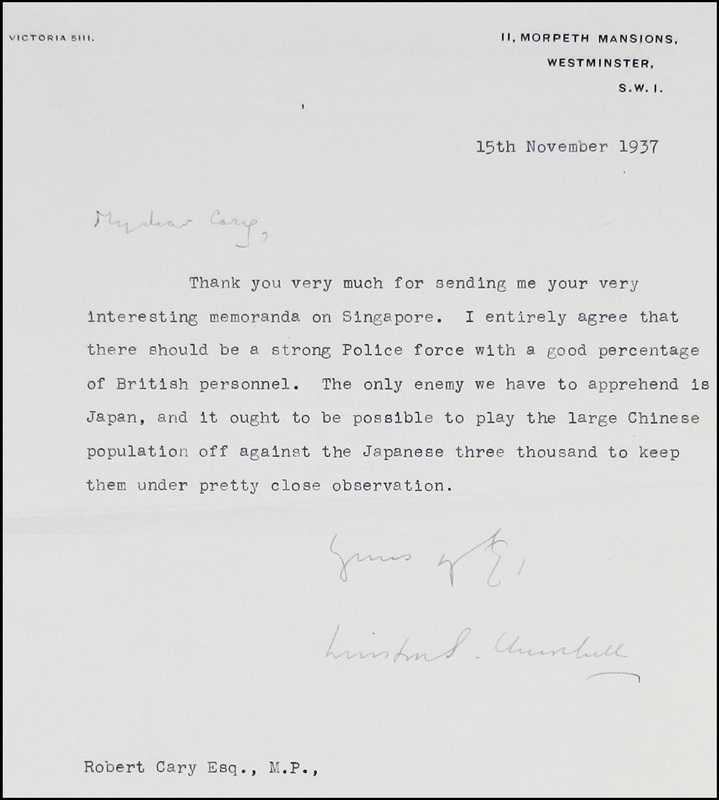 Cary and Churchill shared a concern for global security, as evidenced not only by Churchill’s 15 November 1937 letter to Cary regarding Singapore, but also by Cary’s numerous queries to the Prime Minister in the House of Commons in 1937 on topics including expansion of the Royal Air Force and the reform and recruiting needs of the Army. 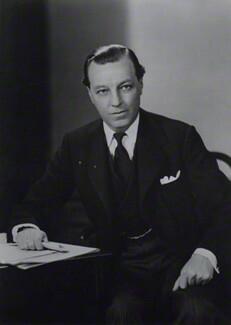 From 1951 to 1955, during Churchill’s second premiership, Cary was private secretary to the Lord Privy Seal, and also Leader of the House of Commons. He was made the first Baron of Withington in 1955 in Churchill’s final year as Prime Minister. Cary’s archive consists of three ruled paper journals measuring 12.75 x 8 inches, bound in quarter red cloth spines over green boards. 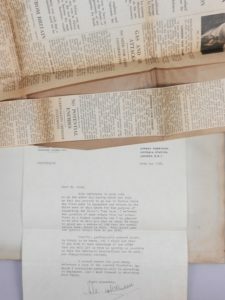 One, labeled on the front cover “Daily Journal 1938, contains nine typed, signed pieces of correspondence to Cary from that year, as well as newspaper clippings. Most notable among this correspondence are two letters. 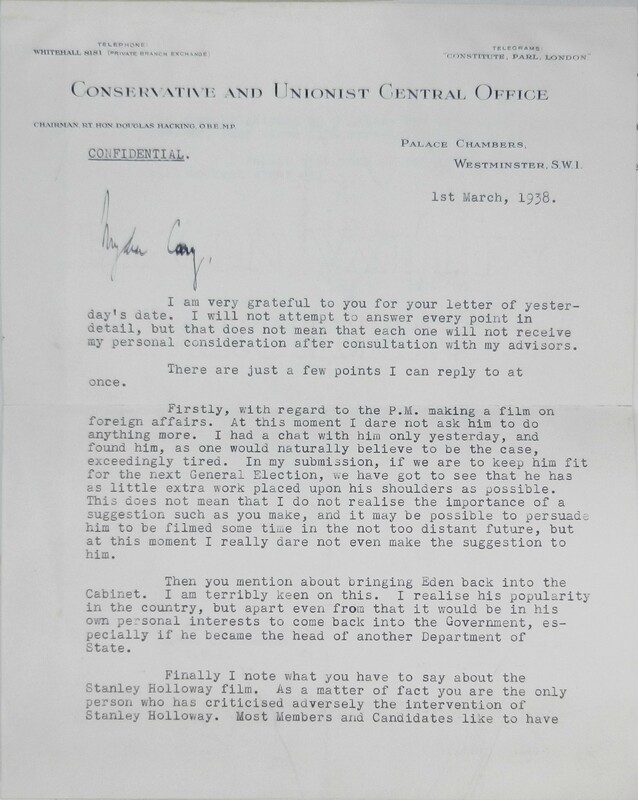 The first is a typed, signed letter from Winston Churchill dated “15th November 1937” on his “11, Morpeth Mansions” stationery regarding Singapore: “I entirely agree that there should be a strong Police force with a good percentage of British personnel. 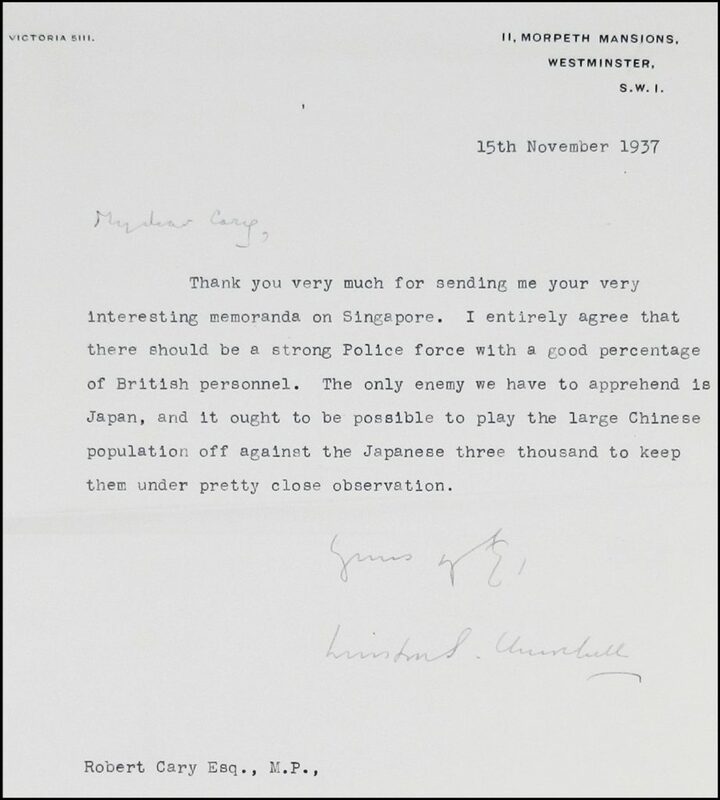 The only enemy we have to apprehend is Japan, and it ought to be possible to play the large Chinese population off against the Japanese three thousand to keep them under pretty close observation.” The letter bears Churchill’s holograph salutation “My dear Cary” as well as Churchill’s holograph signature “Winston S. Churchill”. A little more than four years after Churchill’s letter to Cary, Singapore was to prove a nadir of Churchill’s wartime premiership. The Japanese invasion of south-east Asia began almost simultaneously with the invasion of Pearl Harbor in early December, 1941. Singapore was viewed as virtually impregnable – the “Gibraltar of the East”. However, her British defenders proved unprepared for the speed and ferocity of the Japanese advance. General Percival’s troops were soundly defeated in Malaya on December 11/12, 1941. Retreating to Singapore, Percival spread his men out too thinly, and many troops played no role in the final battle, from February 8-15, 1942. 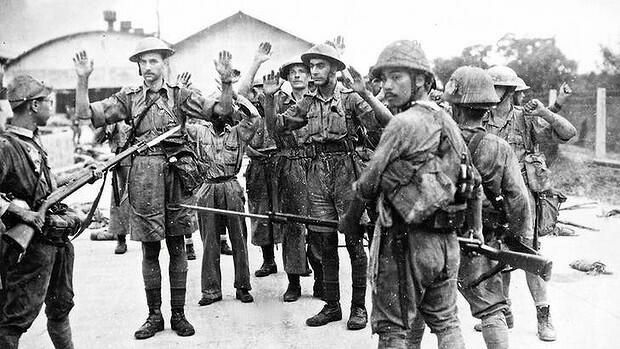 On February 15, the British and Dominion troops in Singapore surrendered unconditionally to the Japanese, who took 100,000 men prisoner. Many would never return home. That night, Churchill broadcast to the nation. Jock Colville recalled “The nature of his words and the unaccustomed speech and emotion with which he spoke convinced me that he was sorely pressed by critics and opponents at home.” This would prove one of the greatest defeats of the Second World War. The blow both to Churchill and British morale was profound and Churchill “seemed unable to turn the tide of depression.” (Gilbert, Vol. 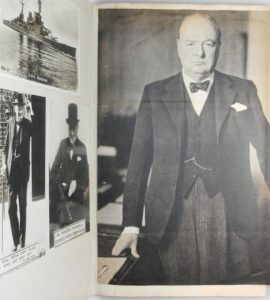 VII, p.59) Pressure from both the public and Parliament led to a restructuring of the Cabinet and on February 17, Churchill endured an acrimonious debate in the House of Commons. That day he had his weekly luncheon with the King, who recorded in his diary that Churchill compared the situation to “hunting the tiger with angry wasps about him”. Also in the “Daily Journal of 1938” are five TLS from Conservative party Chairman Douglas Hewitt Hacking, 1st Baron Hacking (1884-1950). Of particular note is a two-page letter from Hacking dated “1st March 1938”. 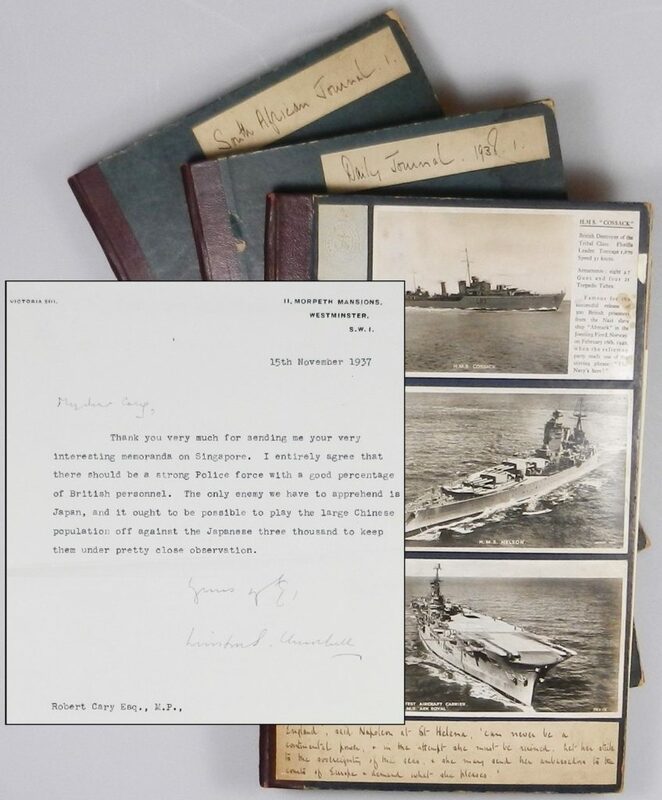 A second journal has wartime photos and postcards of both British navy ships and Winston Churchill pasted on the front cover and within, and also includes 10 pages of Cary’s holograph notes, with additional notes on House of Commons stationery, both laid in and tipped in wartime newspaper clippings, and laid in printed parliamentary papers. Some of Cary’s holograph notes appear to be drafts of Parliamentary comments, as well as notes and 1941 correspondence and a newspaper clipping on the cotton trade. 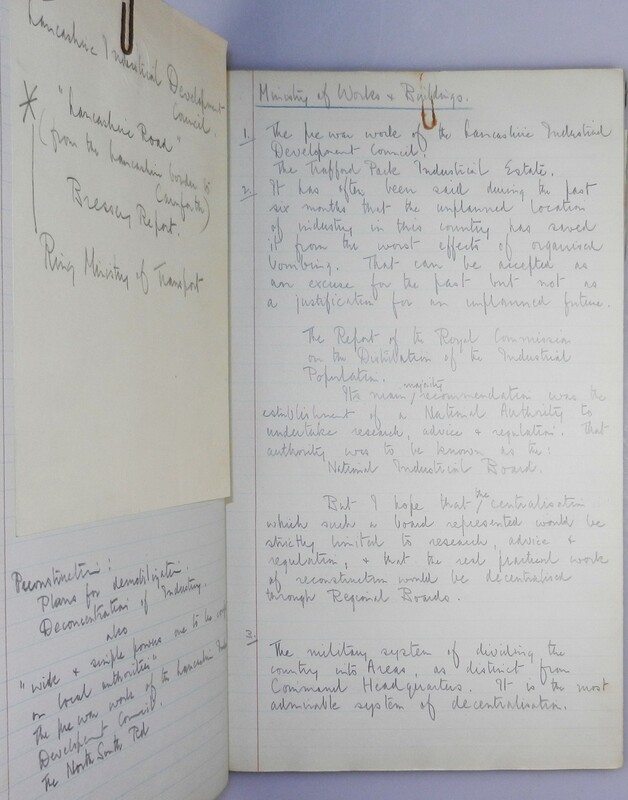 The third and final journal is labeled “South African Journal” and appears to be a journal of Cary’s September 1938 trip to South Africa, including newspaper clippings of Cary’s opinion pieces and speeches, both before and following his trip. 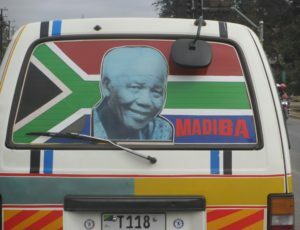 Cary made his travel arrangements in May, the same month of the South African General Election that consolidated power under the United South African National Party of J. B. M. Hertzog and Jan Smuts. We offer this archive for sale HERE.